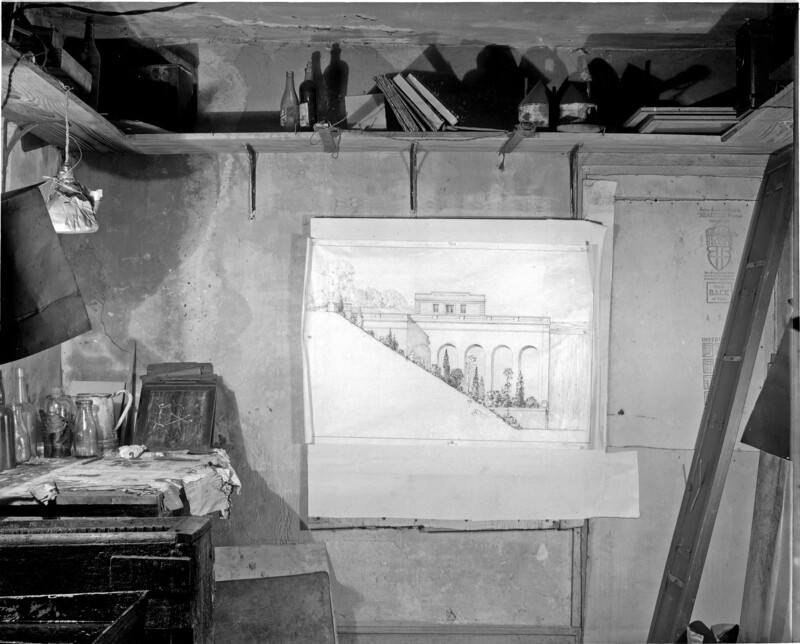 I was asked the other day if I knew who the architect of the Clifton Gate House was? I could not find any information after a couple hours of research. 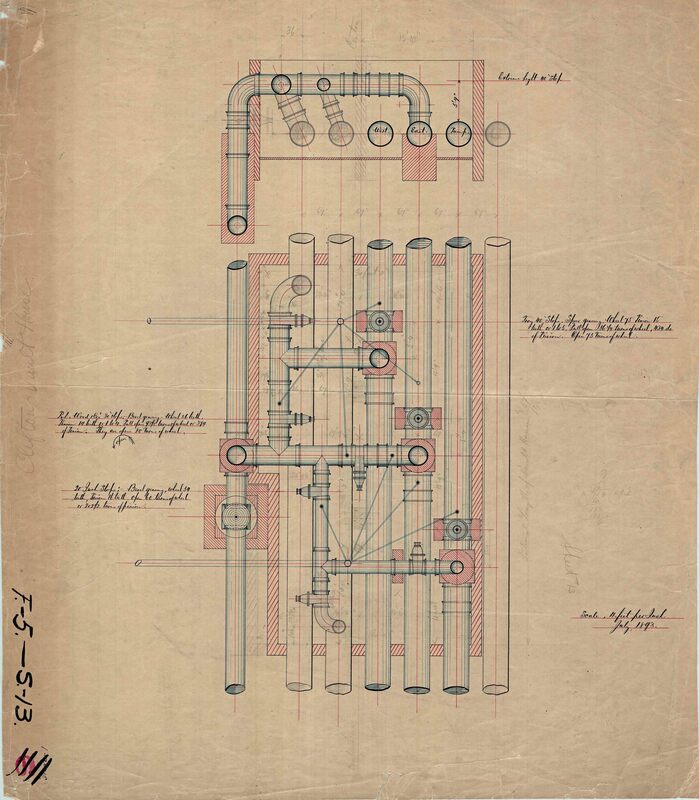 Of course, an internet search took me to the Maryland Historical Trust, where it is noted the architect is unknown, so I decided to look through all the Engineers Annual Reports here in my office. I also looked through a lot of drawings. I found this. Not for the gate house itself, but for the keepers cottage. 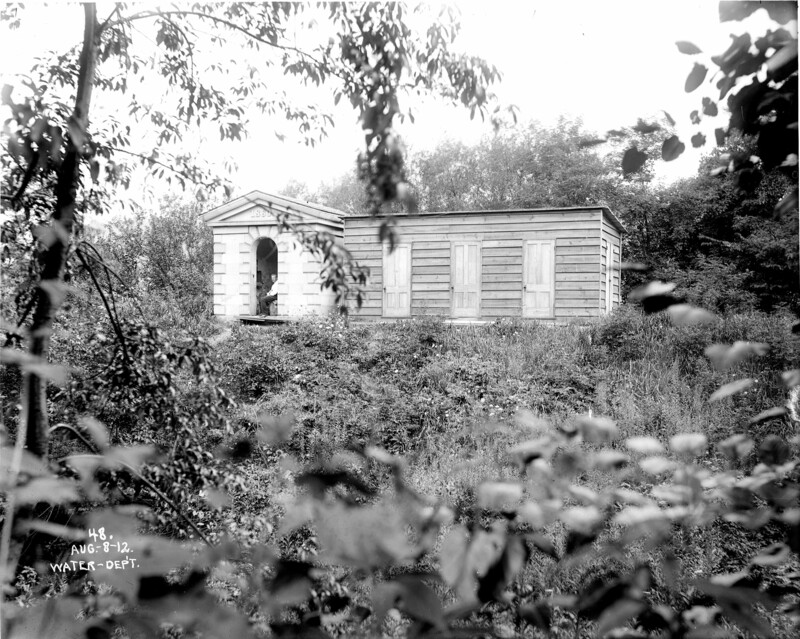 In very faded print it names the architect for the cottage as Jackson C Gott. 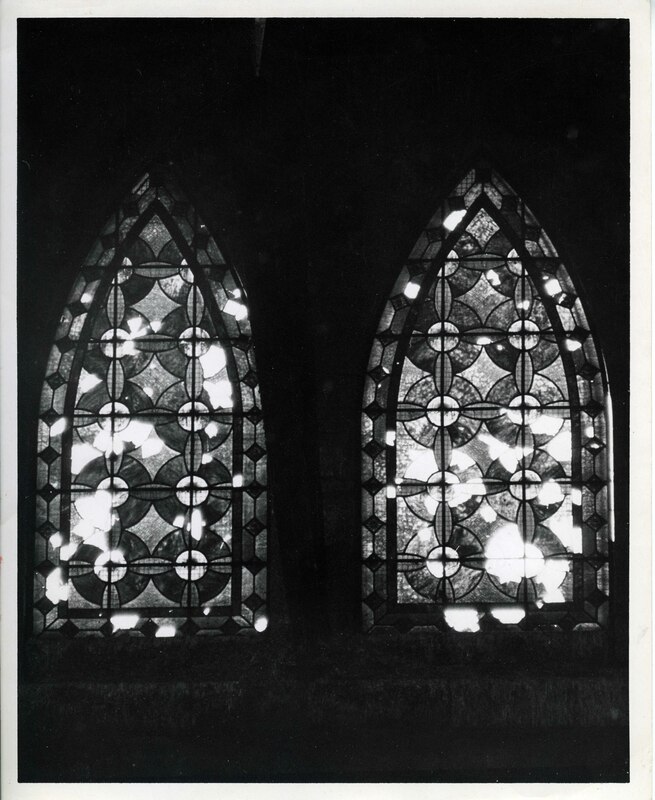 More research revealed a couple interesting photos and prints concerning Gott. He designed two local buildings. 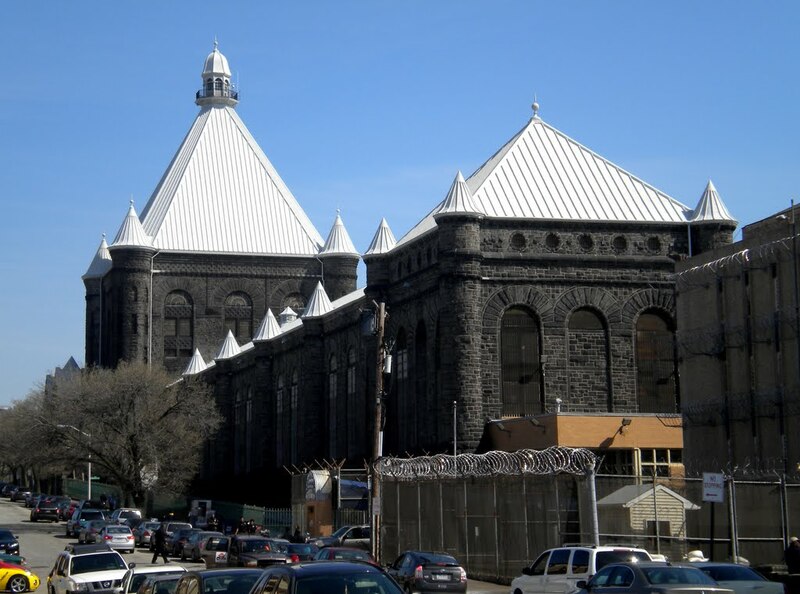 The Maryland Penitentiary. 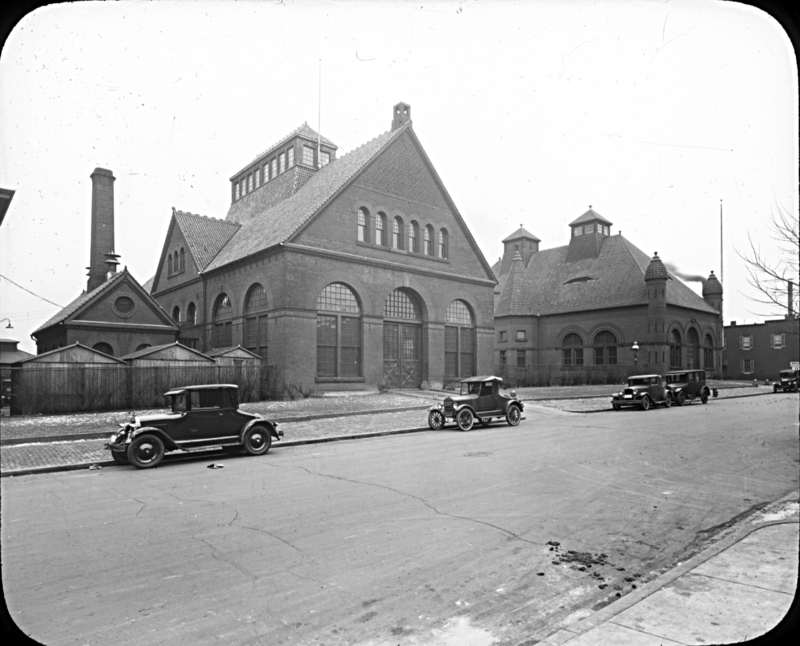 And the Eastern Pumping Station, which I talked about a few weeks ago. 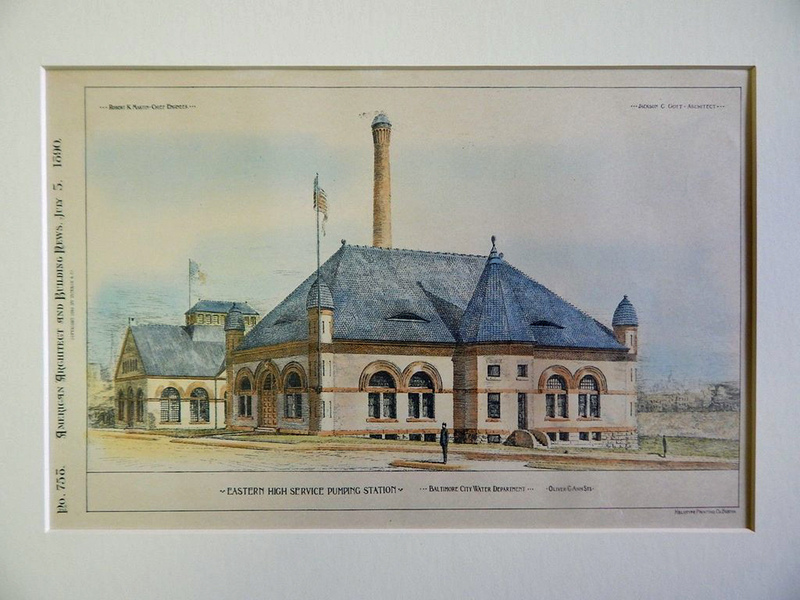 Here is a beautiful print I found at the St Croix website. Below is the Keepers Cottage next to the Clifton Gate House. 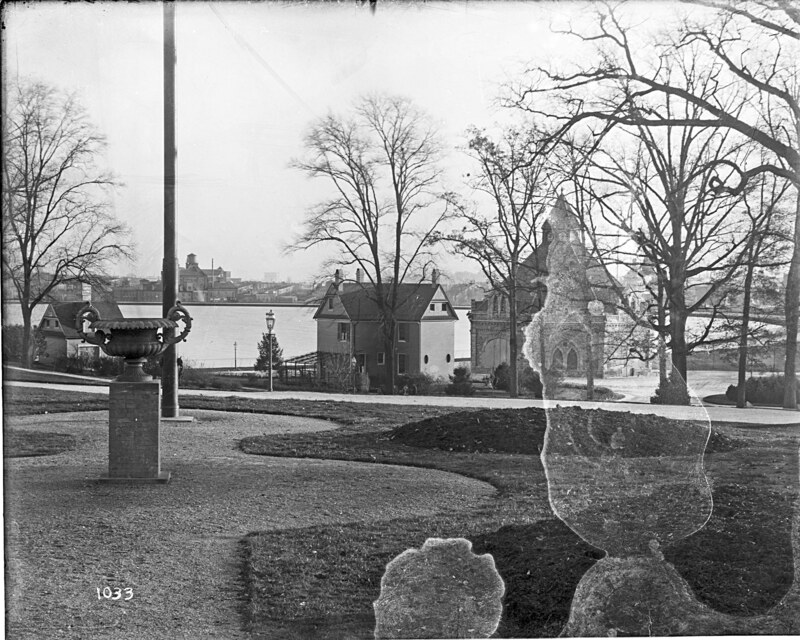 I do not have time to fix this glass plate negative, unfortunately. 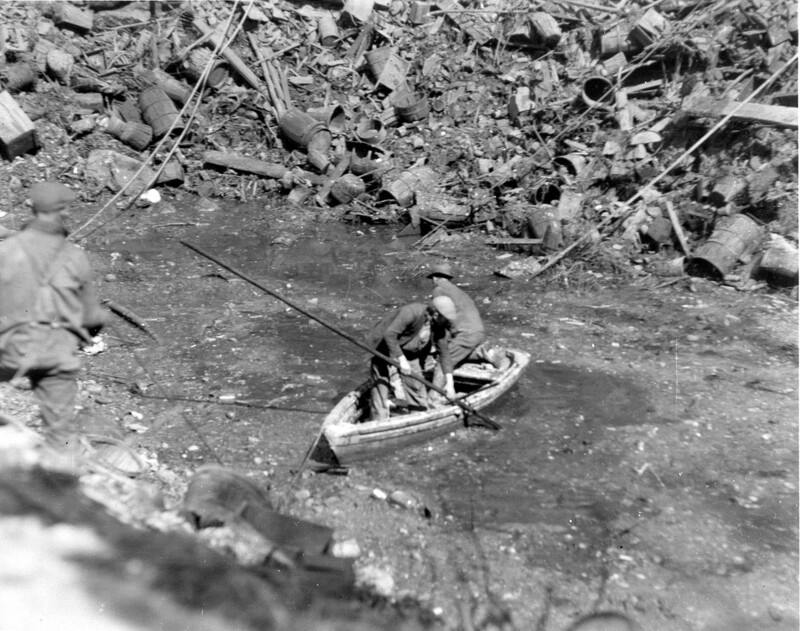 There were two other ramshackle buildings near the gate house, put up by the water engineer to protect the valves, in a pit. 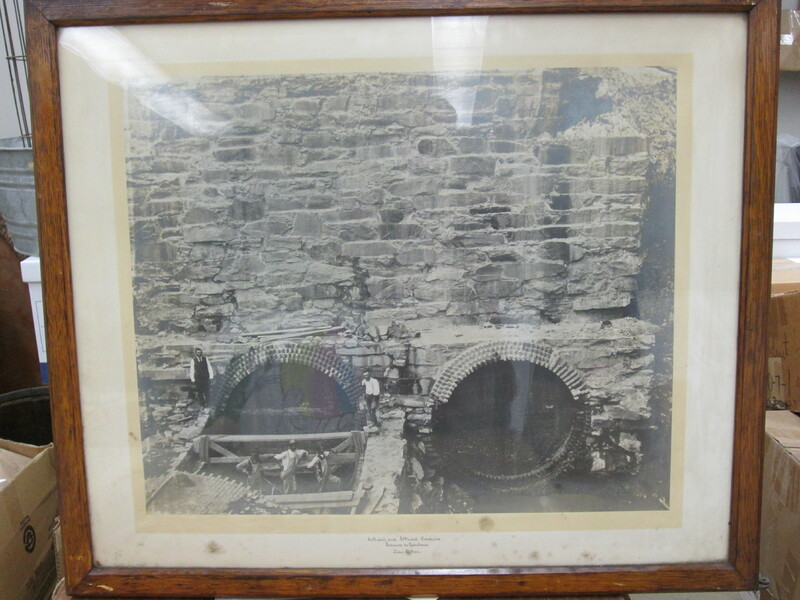 Two drawings of the water mains at the gate house. 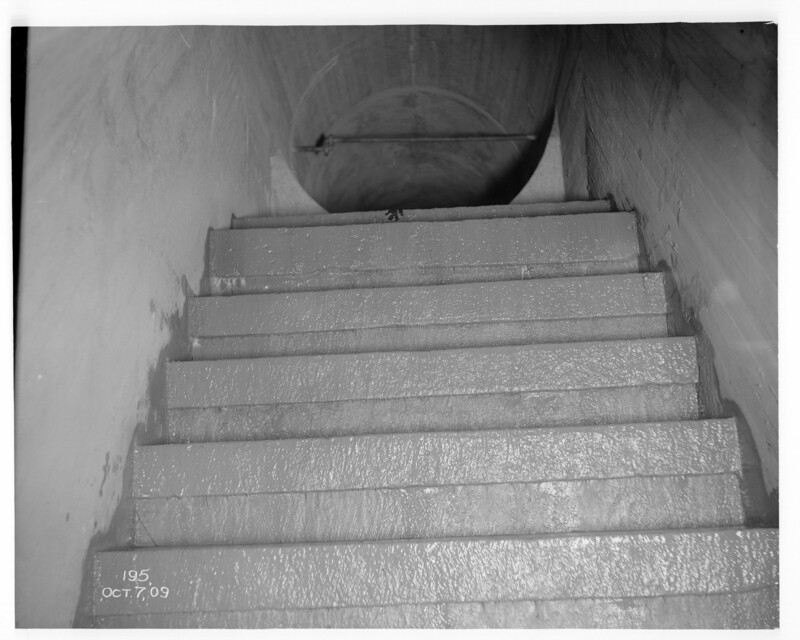 Below shows the location of the venturi meter, added later. 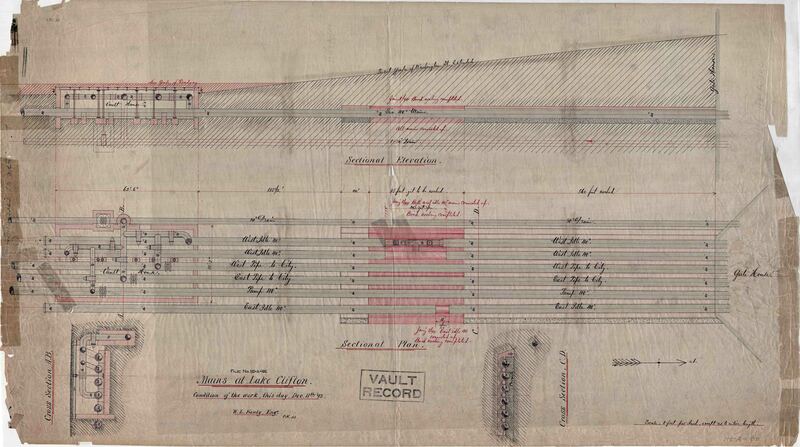 Here is the plans for the building. No architect and it comes from the water engineers office. Curran, Martin and Kenly. 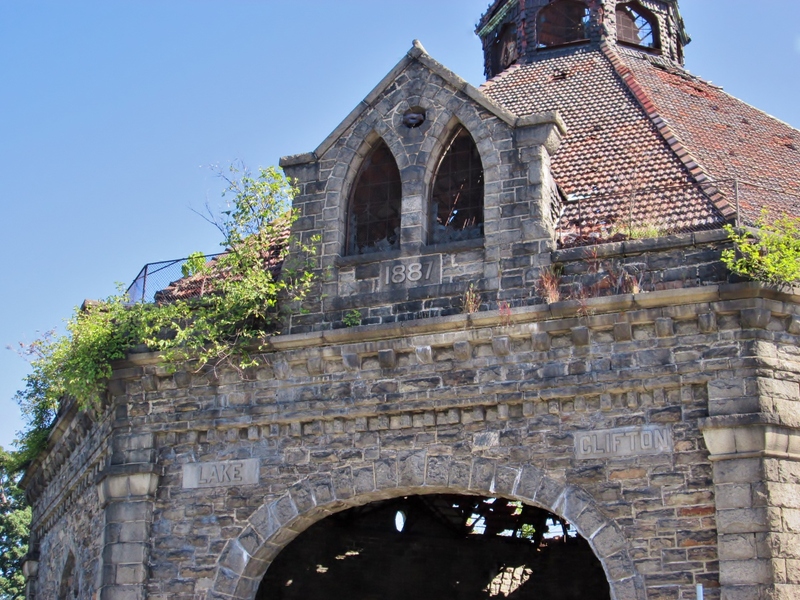 With all that said, looking at the three structures: Gate House, Pumping Station and Penitentiary, I would take a long shot guess and say that Jackson C. Gott designed the gate house. Most prints and photos are from the DPW collection except for the recent Pen photo and the EPS print, which is mine. Went to check on the status of the work being done at the old EPS down on Wolf St. (Not to be confused with the Eastern Avenue Pumping Station). 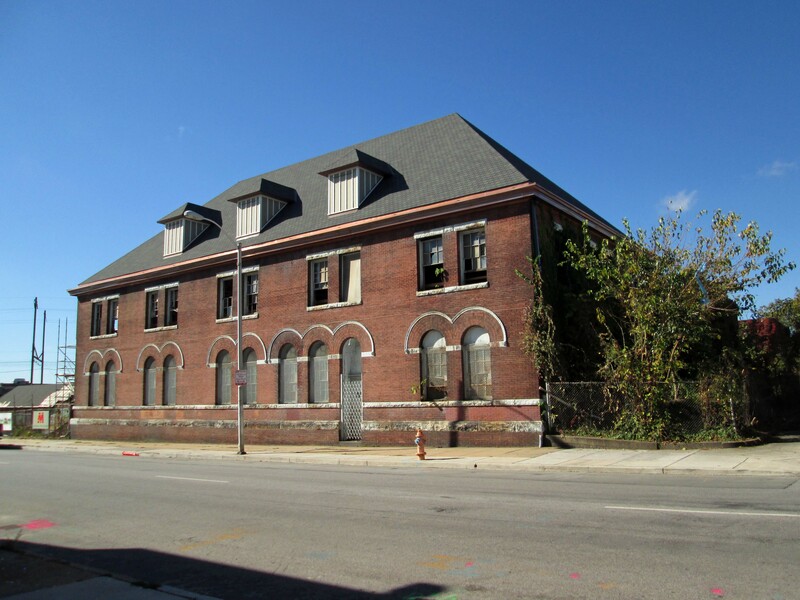 The first thing I see is a new roof on the old Gay St. Yard, which later became City S/R 06 then part of the Transit and Traffic storage yard. 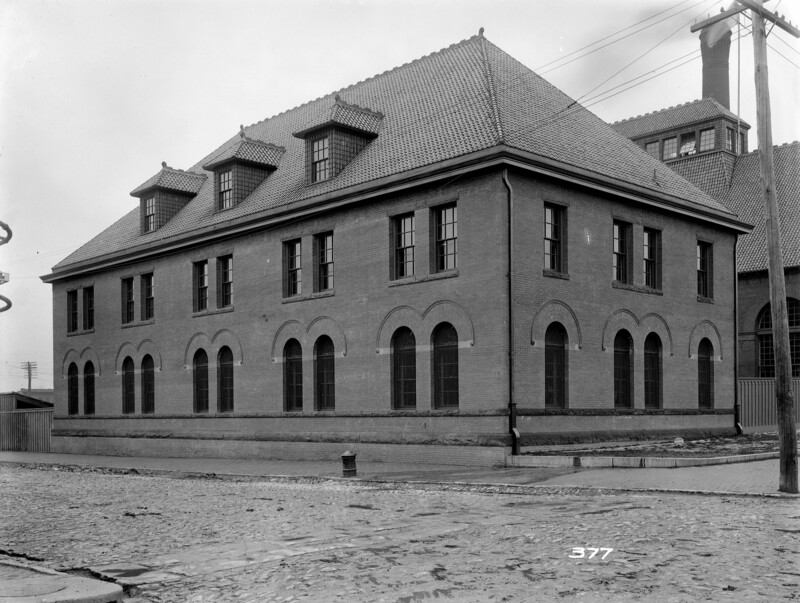 Below is what the building looked like when it was first built. Sign on the gate showing what is going on. The gate was opened so I invited myself in. Something I’m not sure of, because I thought the Pumping Station was a Historic Place, why does this banner show it as a flat roof (green)? 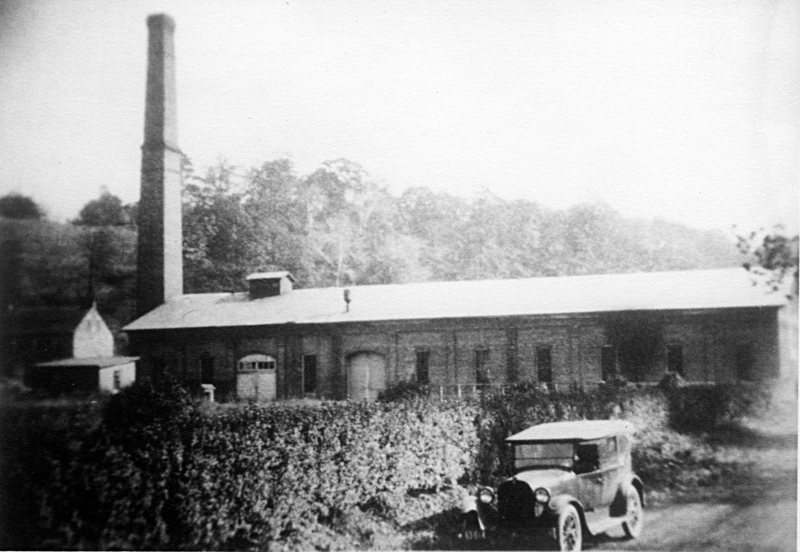 The building to the right is what it originally looked like. This building was just recently put up. 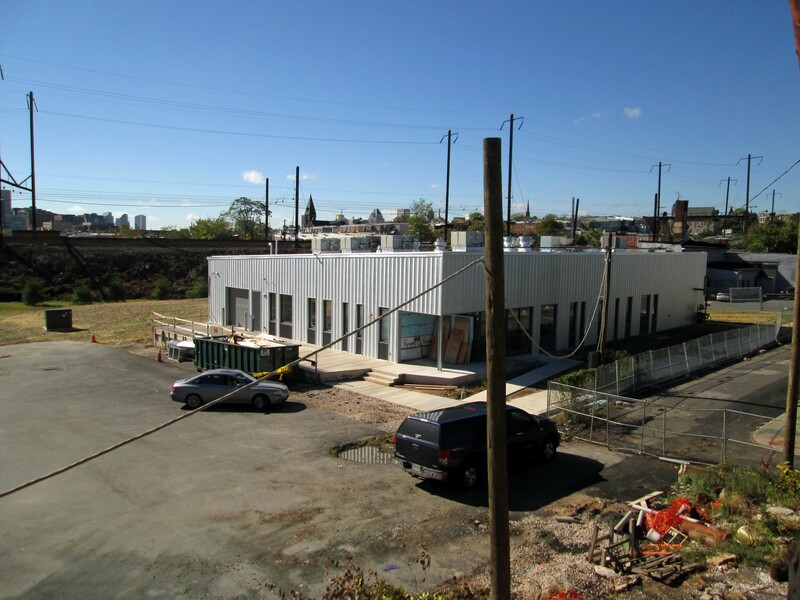 It is called the Food Incubator (Best to go to the Foodhub website for more info on this) I went inside here to find the general contractor to ask permission to roam around. Granted. He told me the City no longer owns these 3-1/2 acres. They were bought. And soon to be rented out. 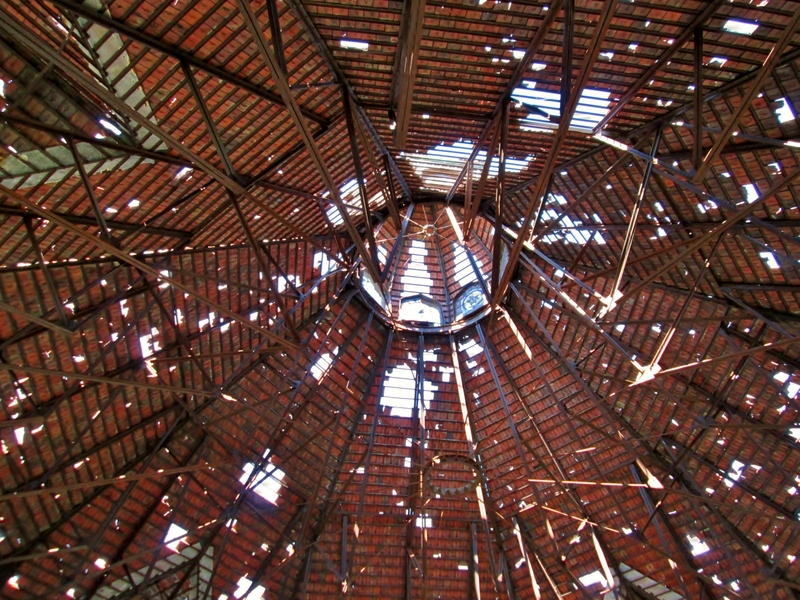 The new roof, as shown in the first photo is only to help protect the property. 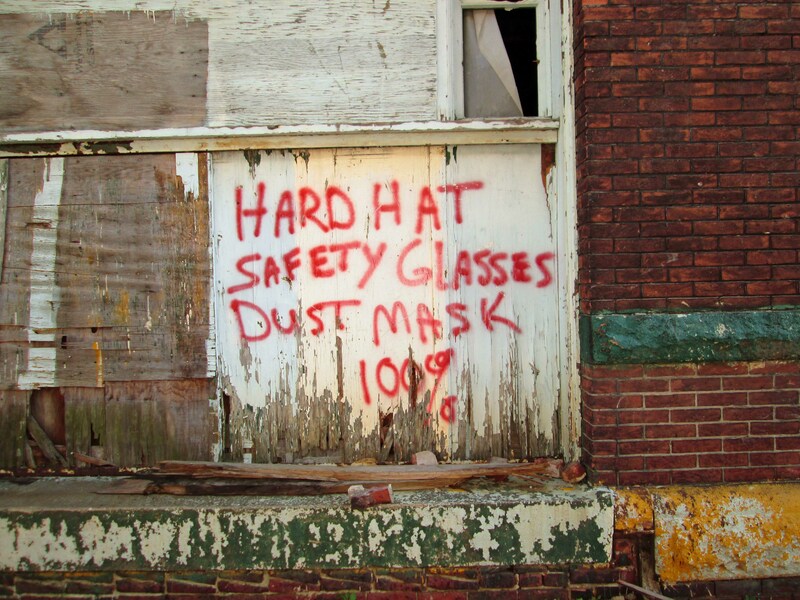 It will be up to others to fix the buildings. 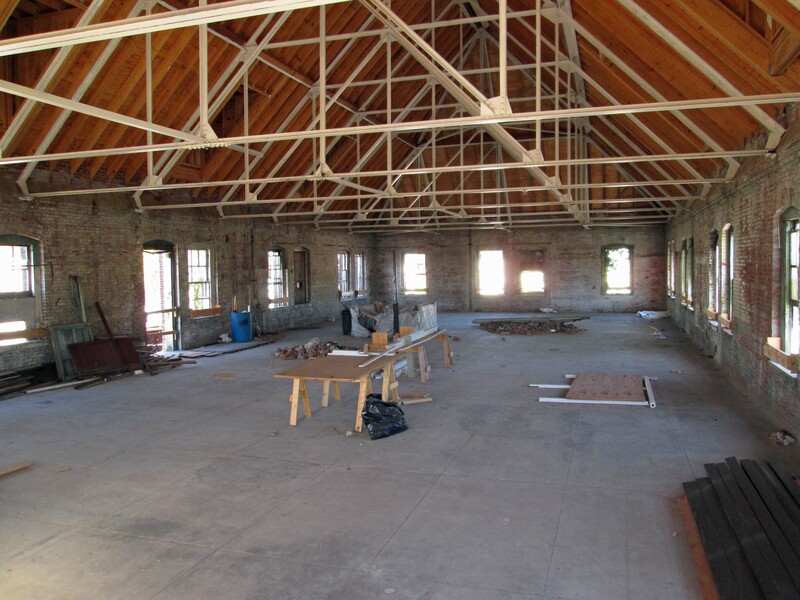 The pumping station ready to be rented out. Someone actually went thru and cleaned the inside of these buildings. I was here in 2014 and it was a mess. Hallway up to the 2nd floor. 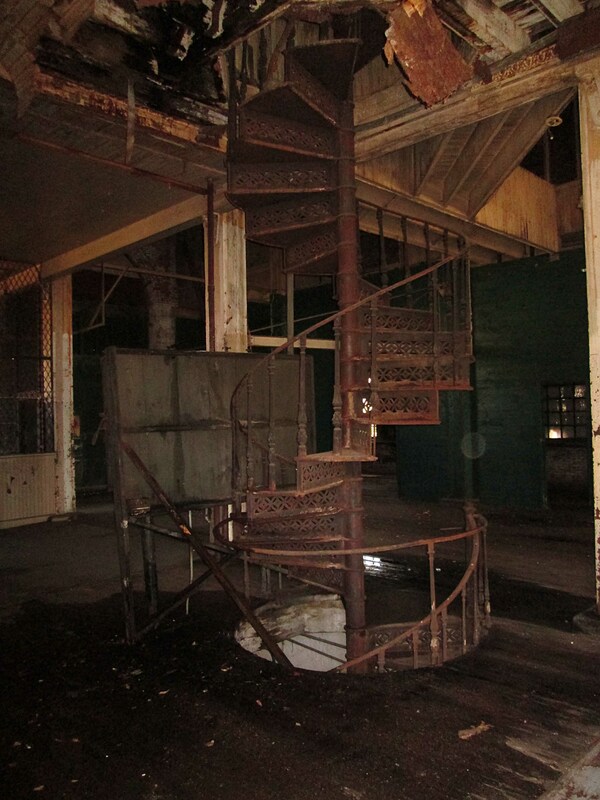 Last time I was here, I was able to go up and down this spiral staircase. 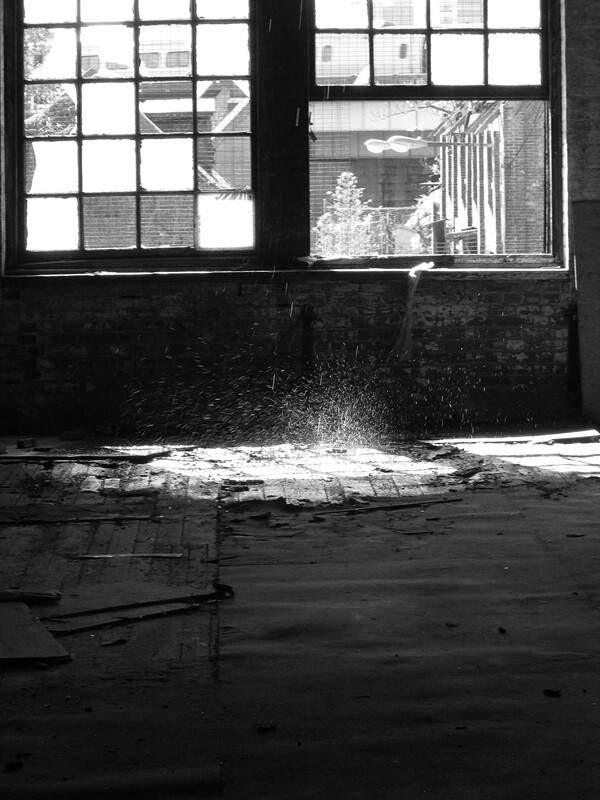 Last night’s rain splattering on the floor. 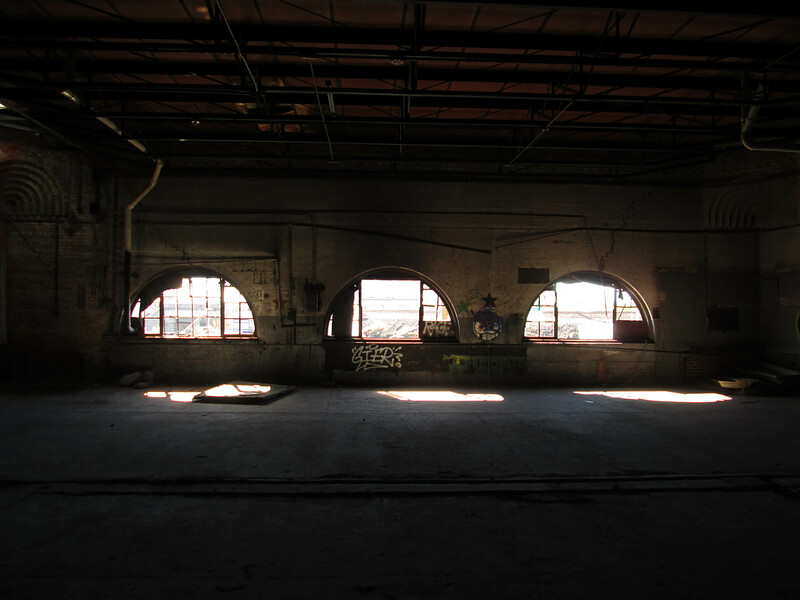 These shots are all of the old maintenance shop. They made valves and hydrants here. 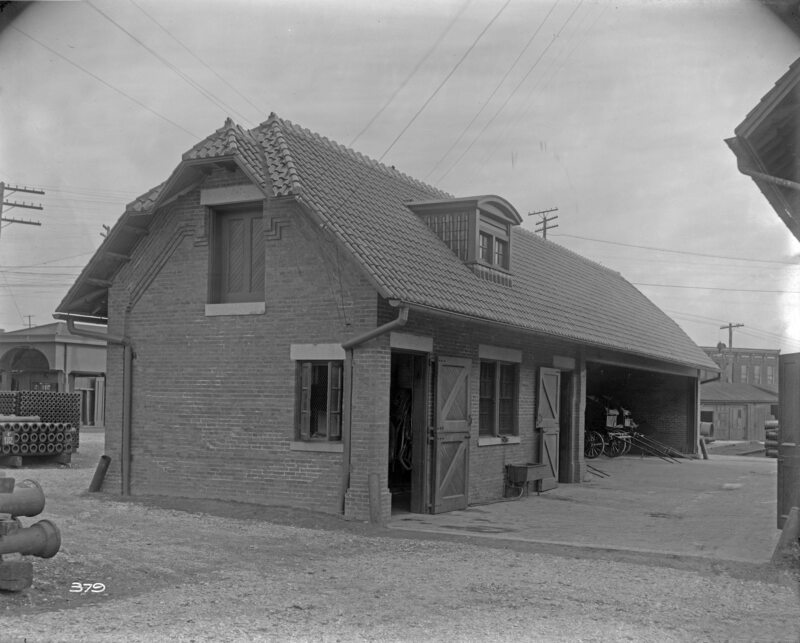 The maintenance shop, in middle, and the storage yard. P.S. to left. I think this sign should have been at the front gate?! 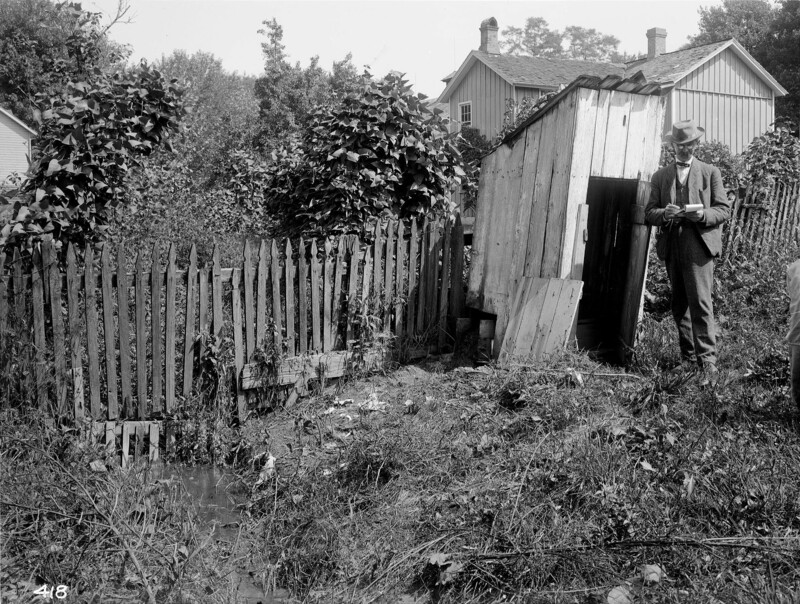 I believe this was the workmen’s bath house. It is completely gutted now. This is the rear of the first building with the new roof. Steps inside are shot, so I took the scaffold up. 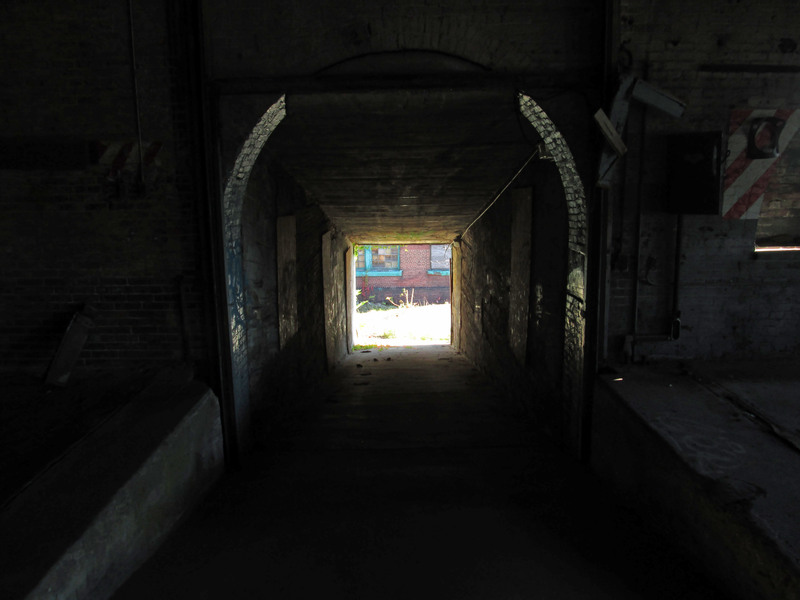 Headed across the yard to one of the shops/carriage houses. The blacksmith shop had burnt down a few times. 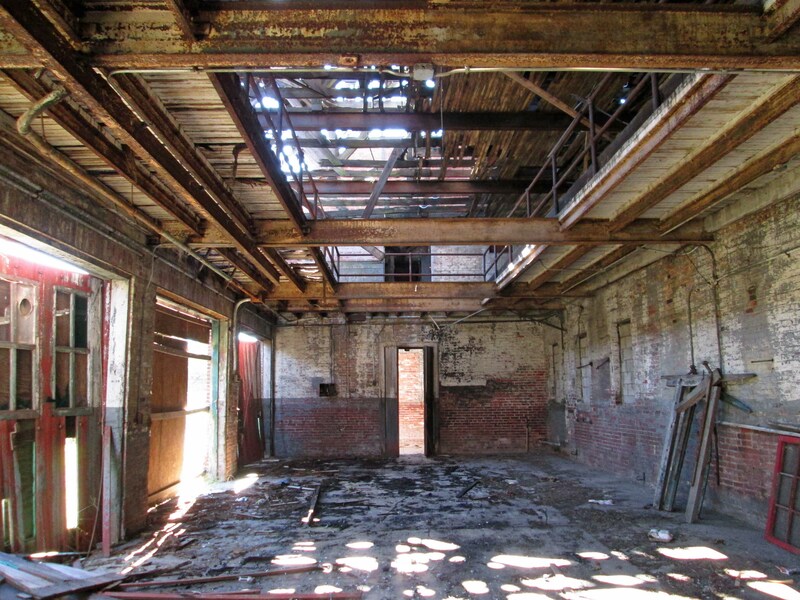 Here is what the above building use to look like. Looking from stables back towards main buildings. 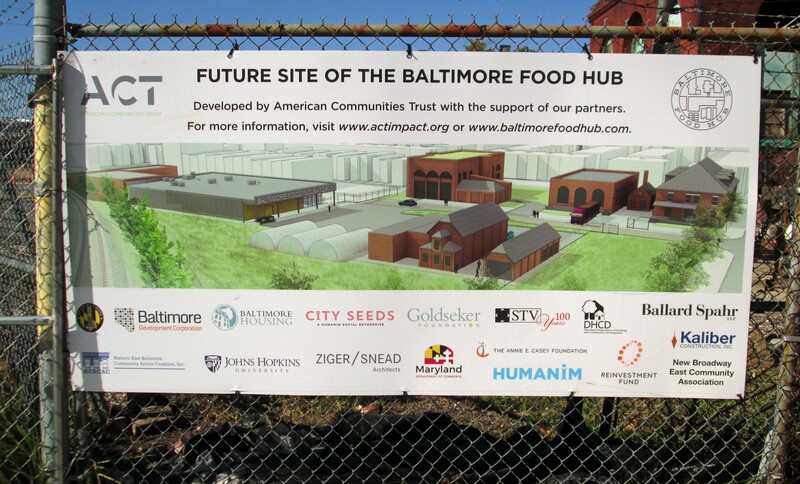 This was from the Food Hub’s brochure. When I was in front of the building, this was all grown over. 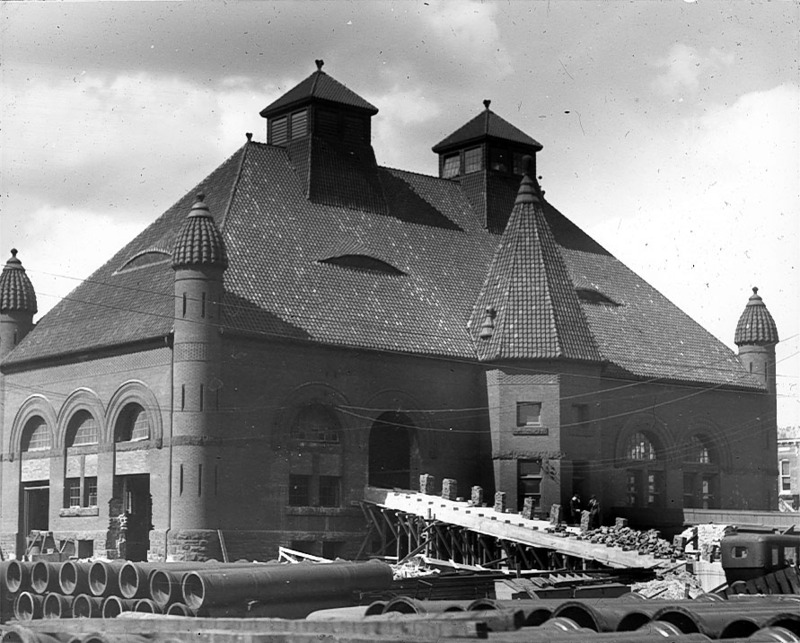 Although the date says 1890 my notes tell me that this Pumping Station was completed in 1891. 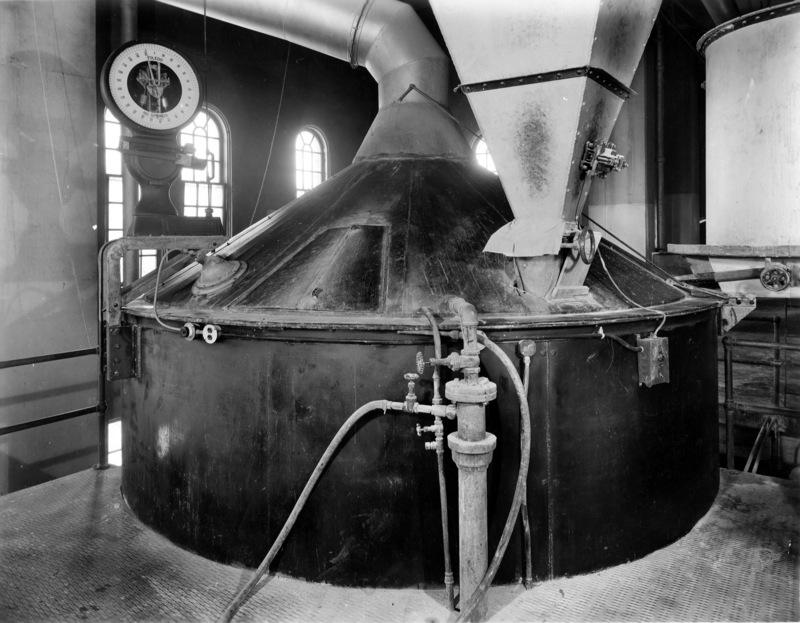 If you send me your email, I will send you a brief word document covering the history of these buildings. 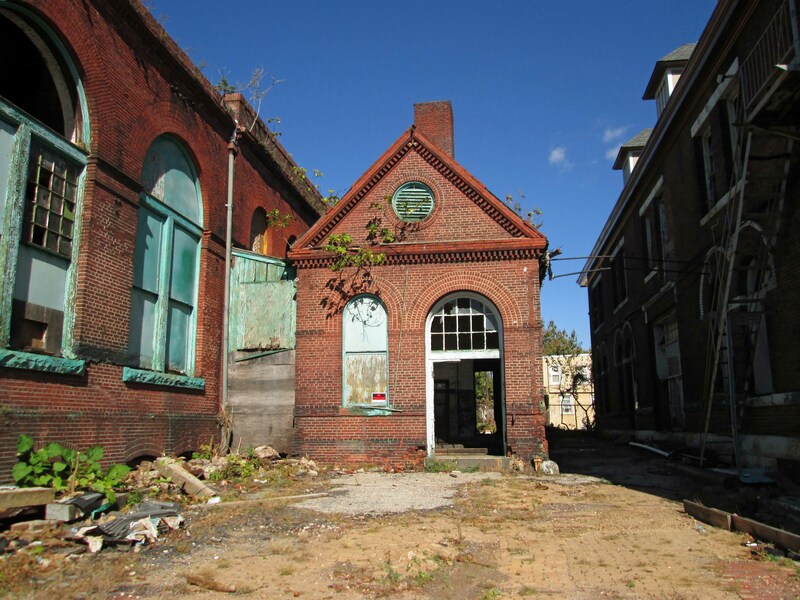 When the Valve House is renovated and attractively landscaped, it will attract people who pause for pastry, coffee, ultra-local freshly harvested foods and flowers, art and stories of Baltimore. Stories from our past, presented here, will be outshined by news of the structured opportunities, offered “next door” for careers in the expanding green business sectors. 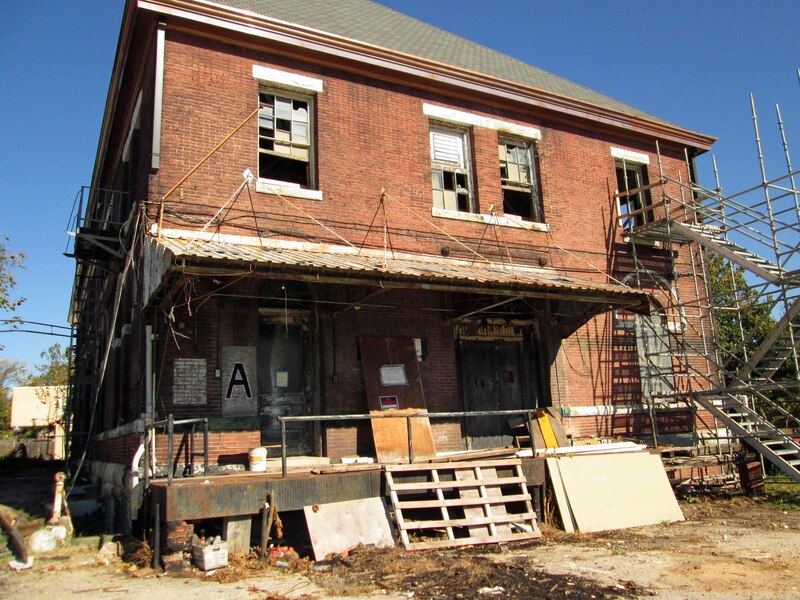 As the renovations to the Valve House are fully realized, the adjacent Lake Clifton campus will become the operational base for Baltimore Center for Green Careers, Civic Works Food and Farm programs and other pathways to prosperity. In the coming decades, these two work in harmony – the information packed social hub and the sustainable-jobs work preparation center. 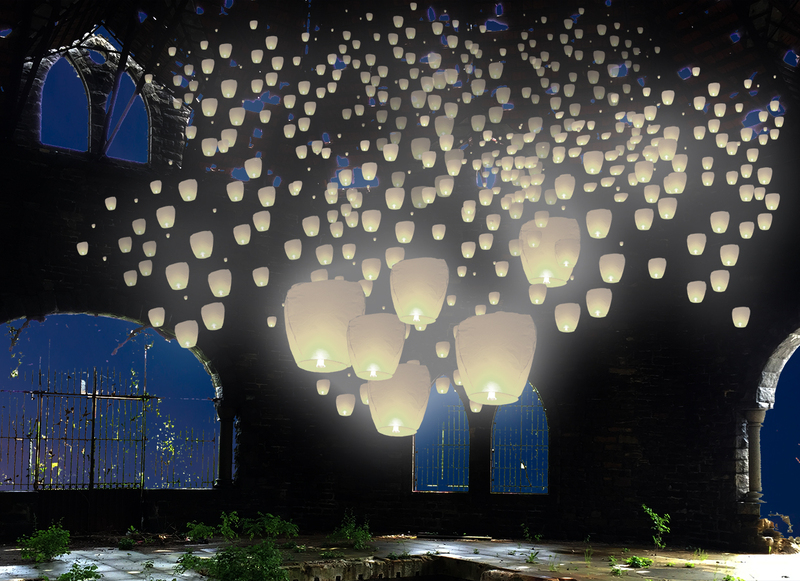 I personally think this is a great idea! And I really hope it happens. 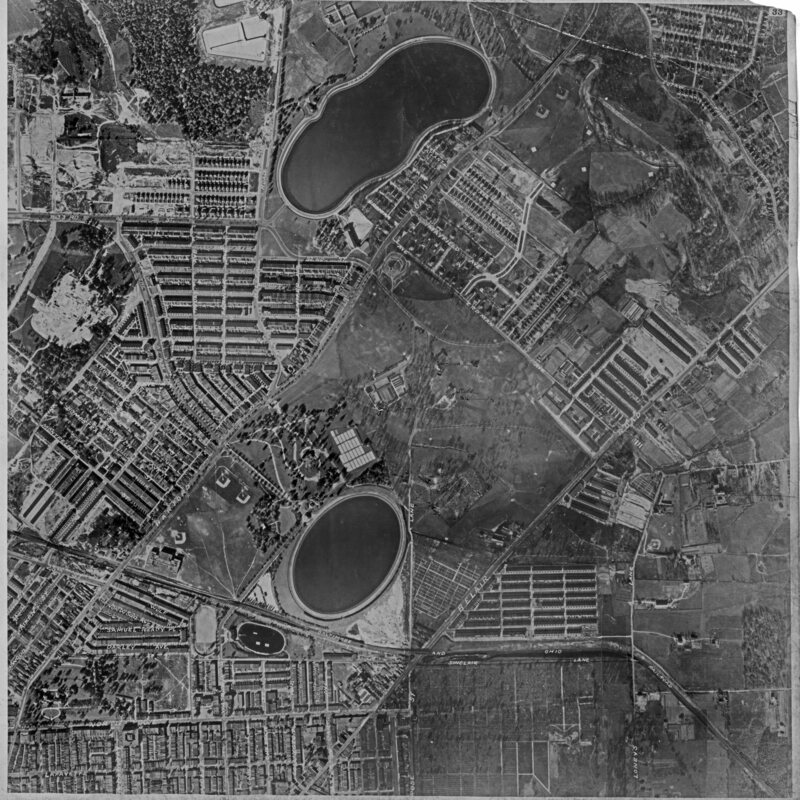 Here is a 1927 aerial of Lake Clifton and its relation to Lake Montebello. Clifton being the one at the bottom. 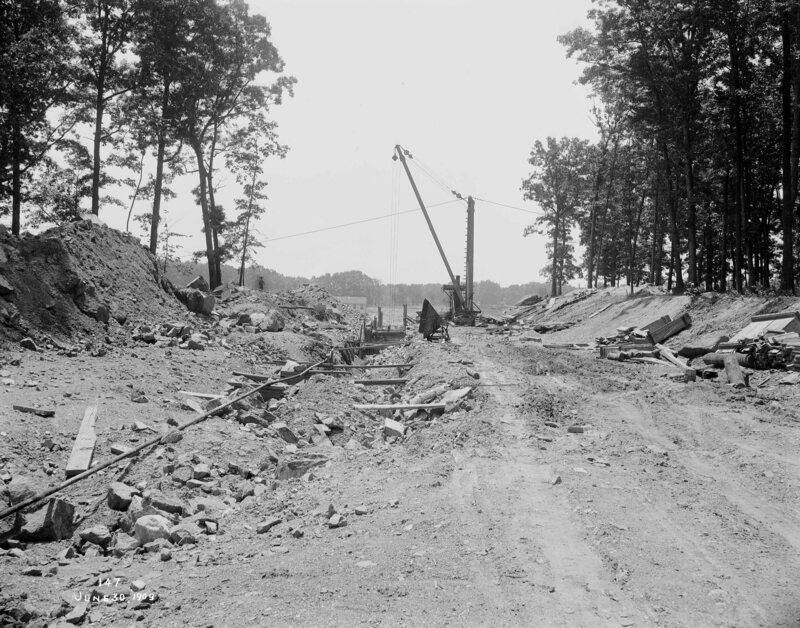 Water flowed from the dam at the Gunpowder Falls, via a 7 mile tunnel to Montebello, then by conduit to Clifton, at which point it was dispersed to the city. 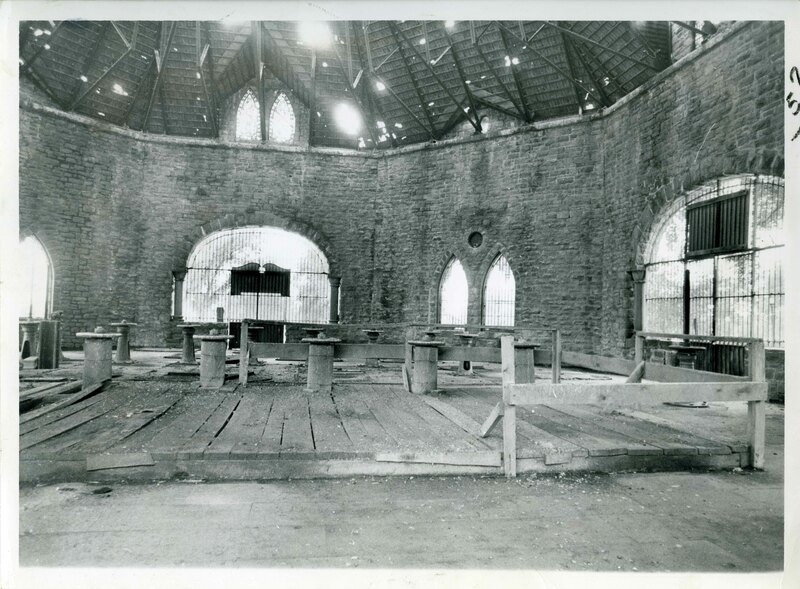 From the 1970s showing the interior of the Gate House with the water chambers covered over with wood. 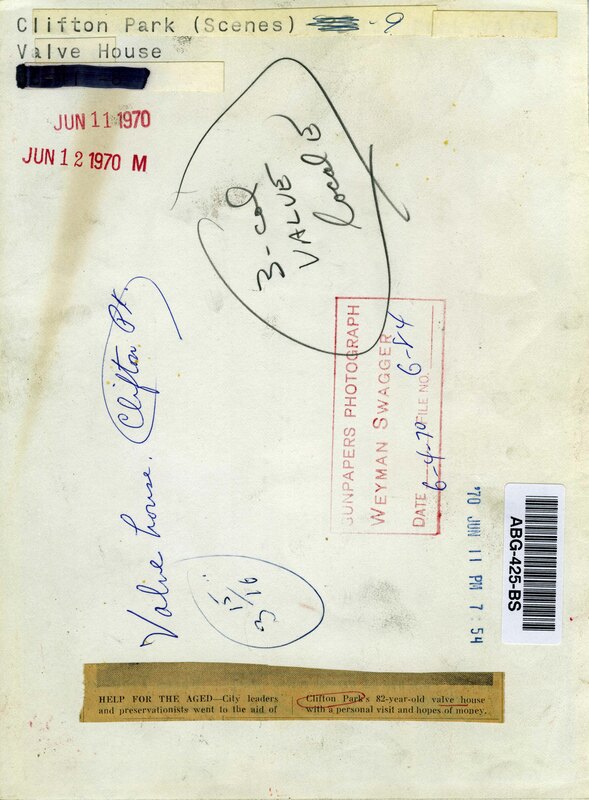 The reverse of the above photo, from the Sunpaper files showing that back in 1970 there was an interest in restoring the Gate House. 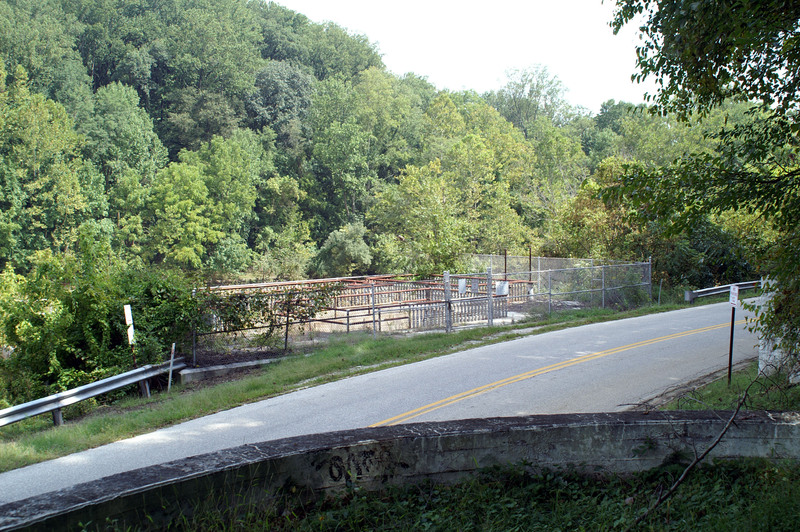 When the permanent water supply from the Gunpowder Falls was built, it included a dam at Loch Raven, a 12′ tunnel approximately 7 miles long, an impounding reservoir at Montebello, another conduit from there to Lake Clifton and then it was distributed to the public as unfiltered, yet wholesome drinking water. 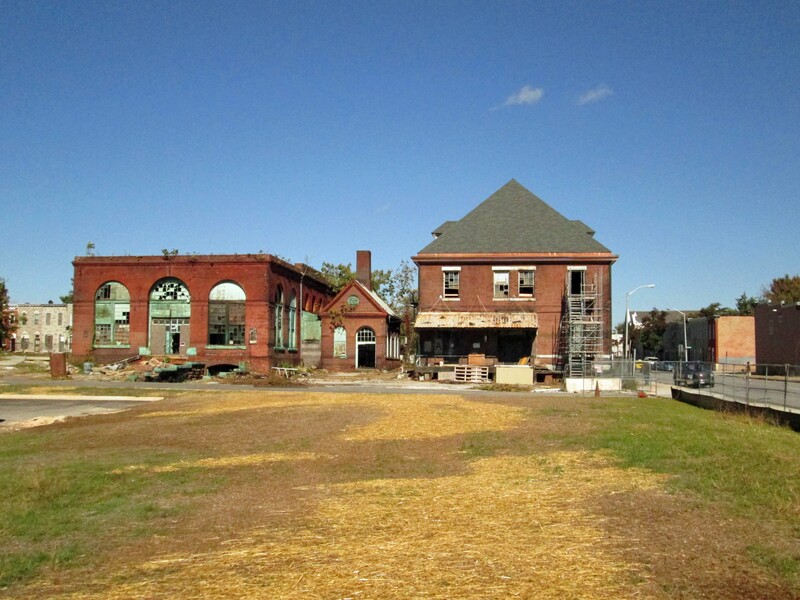 How the gate house area looked in 2011. 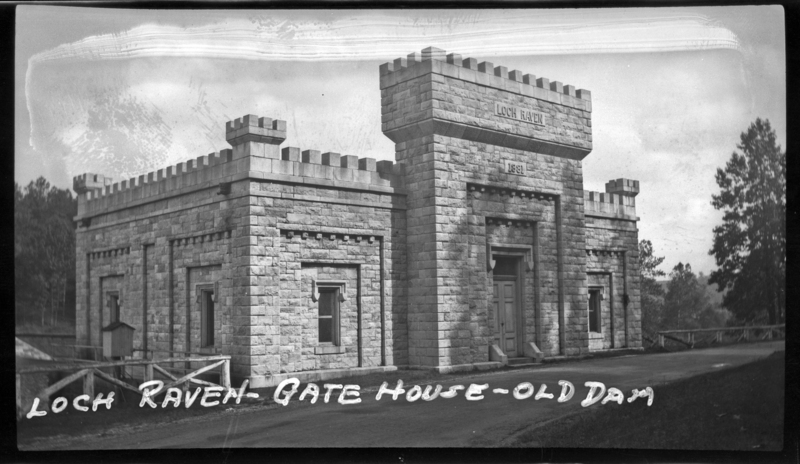 When they eventually removed the gate house, they kept some of the original stone and built this somewhat mini-monument to the Permanent Supply, across the street. 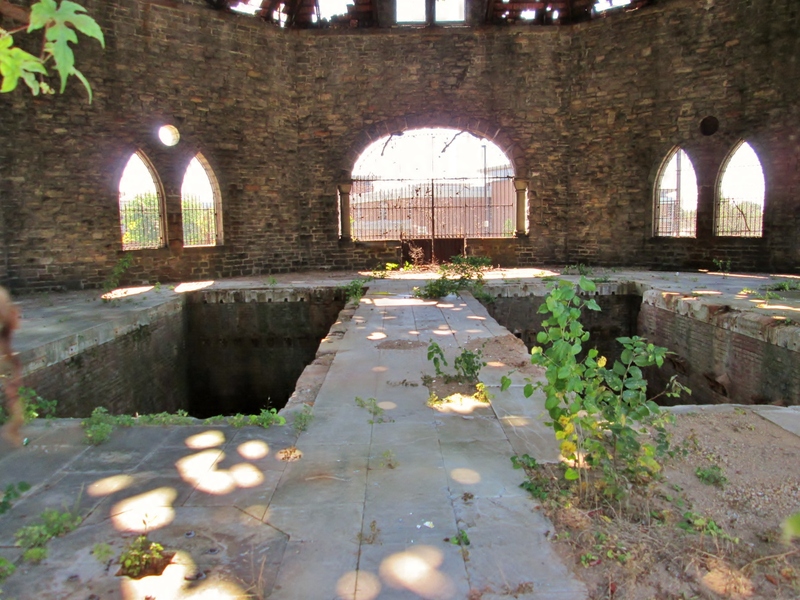 There is a renewed interest in restoring the old Clifton Gate House. I have been invited to another meeting to determine what is to be done with it. I went to one of these meetings a while ago. 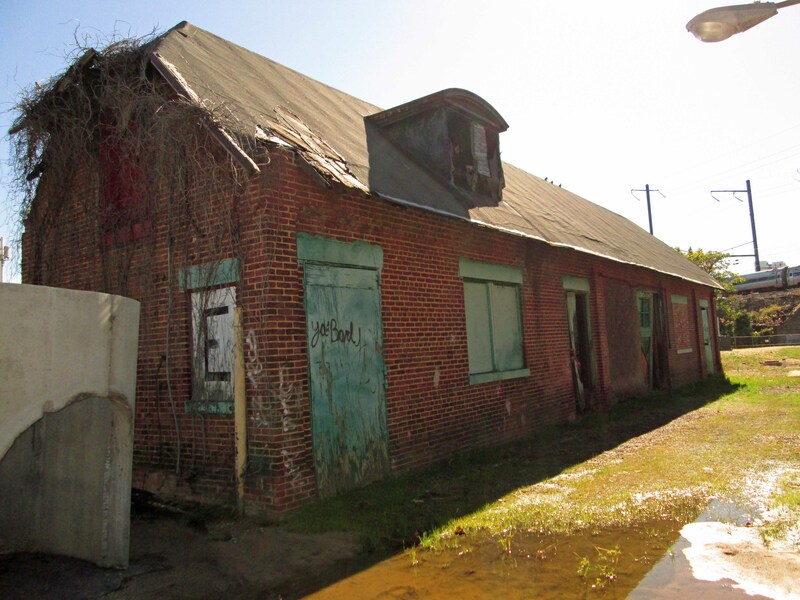 A farmer wanted to turn it into a weekend farmers market. He said he had $10,000 he was willing to invest in repairs! That wouldn’t cover one small portion of the roof (Spanish tiles are expensive!) An interested party for this meeting is Civic Works. I hope they get the ok to take it over. 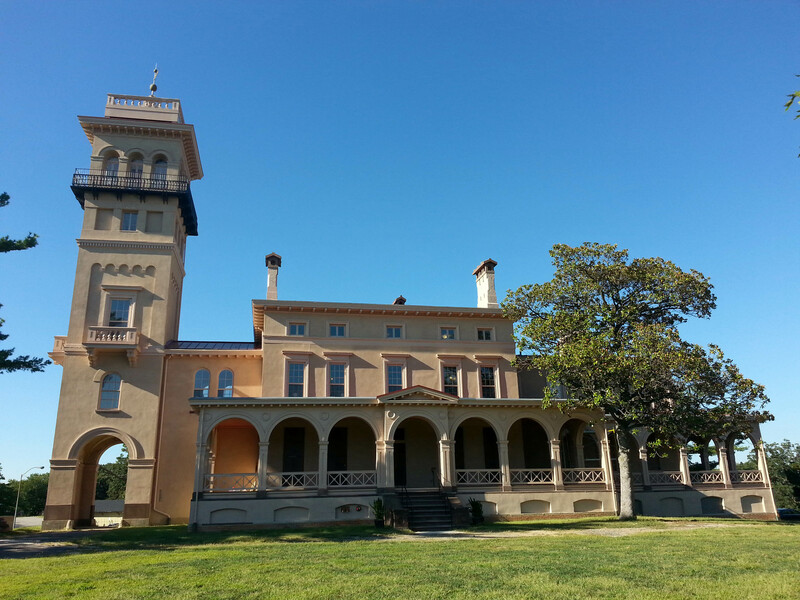 They are currently restoring the Clifton Mansion in Clifton Park. Former estate of Johns Hopkins. It is a great project being done. I enjoy going on tours there. 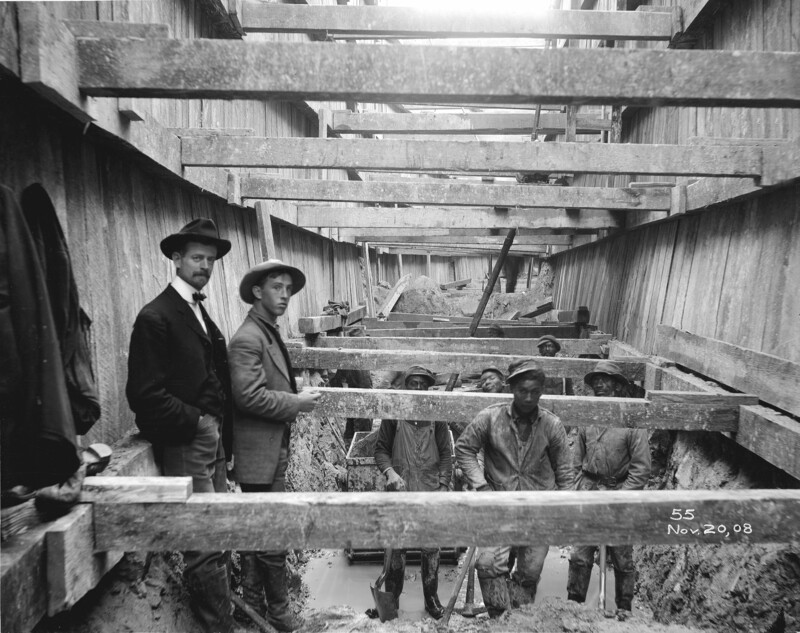 Work at Lake Clifton progressed satisfactorily during 1887. 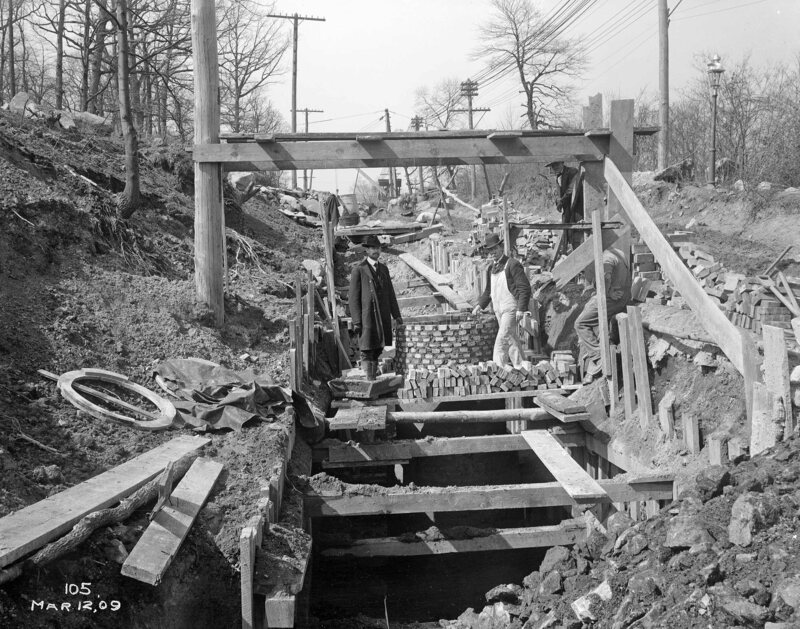 The tunnel connecting Lake Clifton to Lake Montebello was in thorough working order. The gate-house superstructure is well under way. It is believed that it is advanced enough where water can be let into the Lake during the year 1888. From a postcard, soon after building. 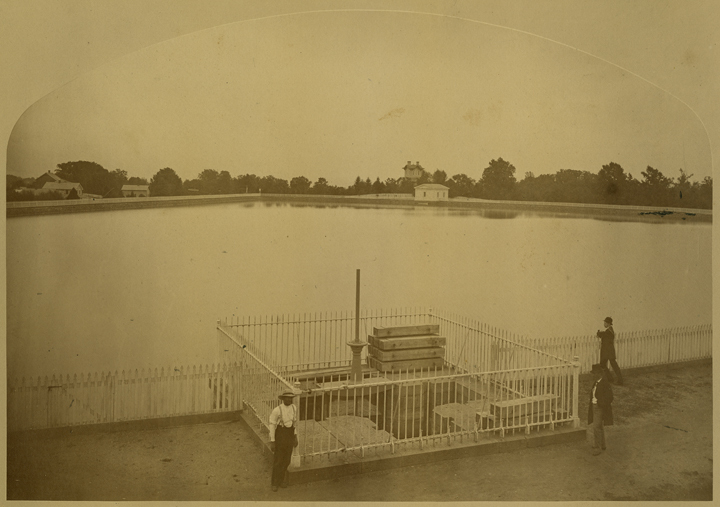 The lake (reservoir) in service and supplying water to the City. 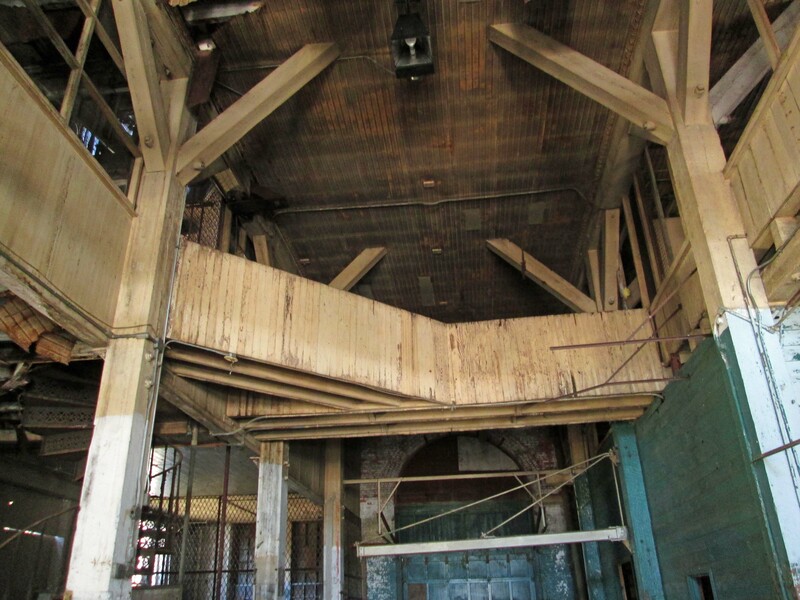 Interior view a couple years ago. 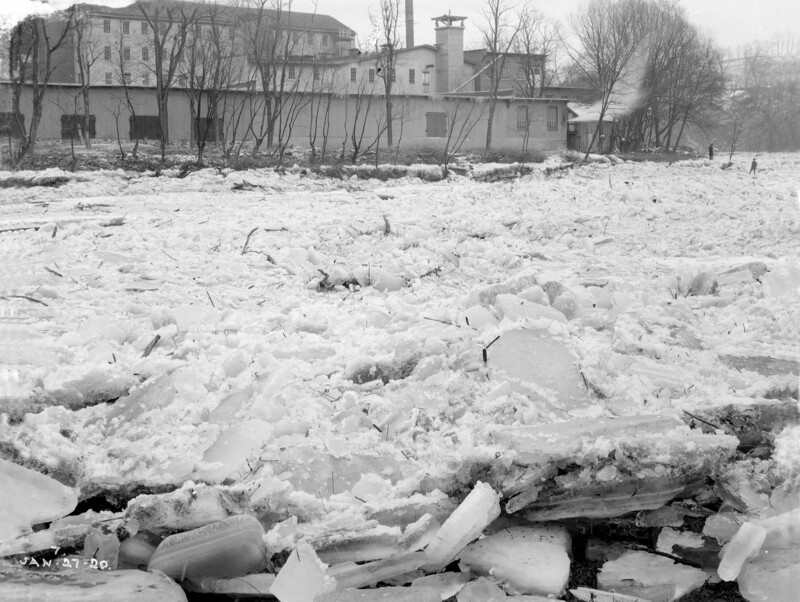 The lake after being drained, to make room for a new school. Graves were found here. 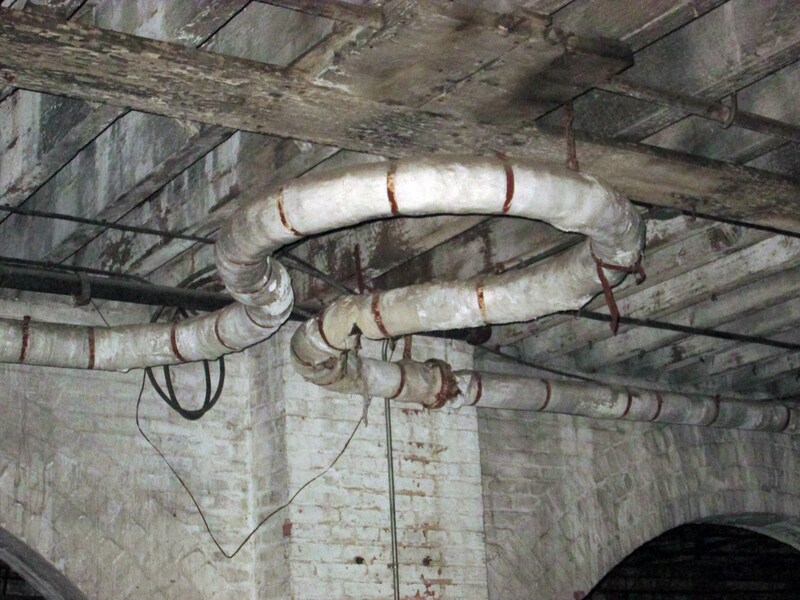 Clifton Mansion being restored by Civic Works. From up in the tower you can see the gate house and the outline of where the lake was. 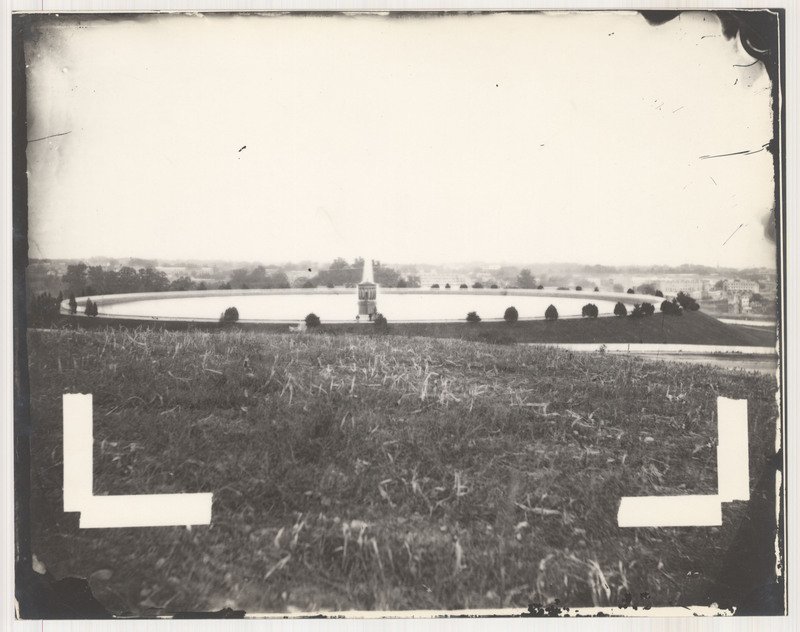 Since starting my research in a museum archives, I’ve found quite a few discrepancies in the labelling of photographs and negatives. 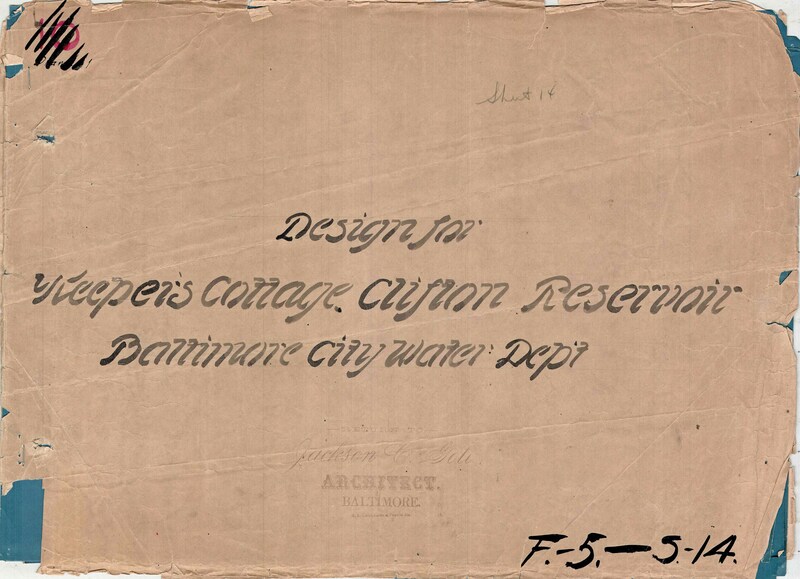 Some archival boxes were marked as Loch Raven Construction – 1909 (Which didn’t start until late 1912. 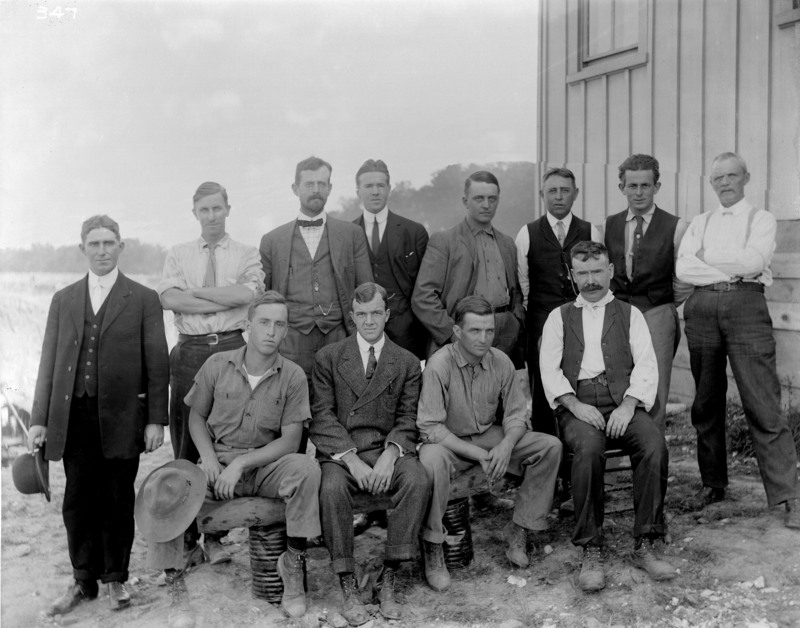 These photos were actually the building of Lake Ashburton). 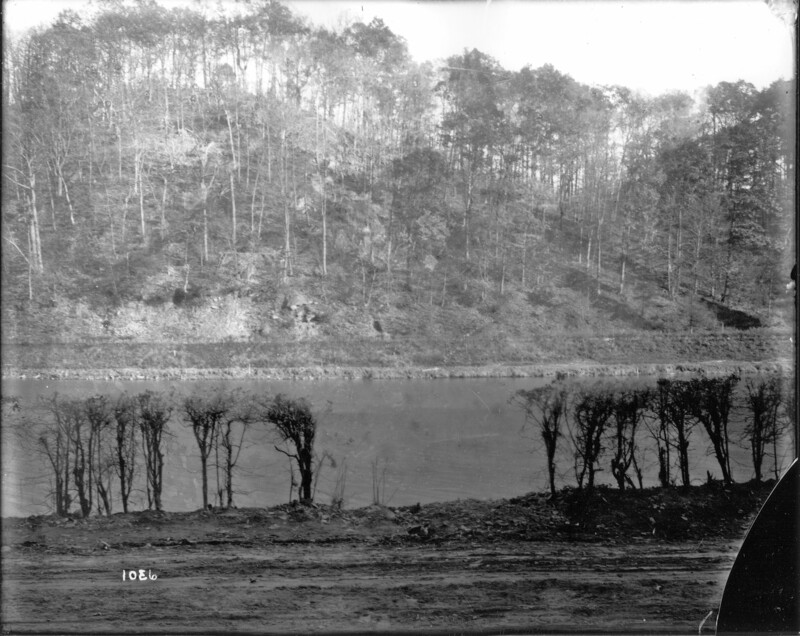 Then there are the glass plate negatives marked as Loch Raven 1875-1881. A few of these are of Lake Montebello and Clifton. This is ok only because I know they are from a group known as the “permanent supply”, they belong together. But my problem is that somewhere along the timeline known as “History” someone decided to call the gatehouses ‘valve houses’ Why?? 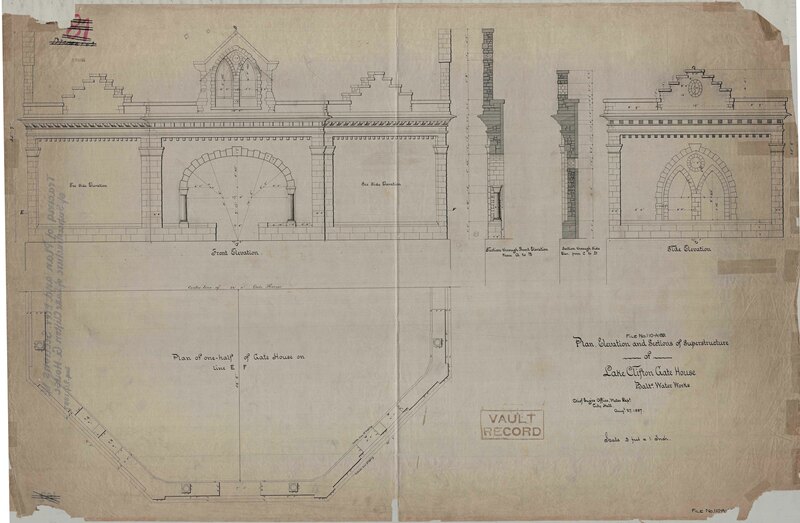 I do not understand the intent of changing the engineer’s designation of a structure from gatehouse to valve house? 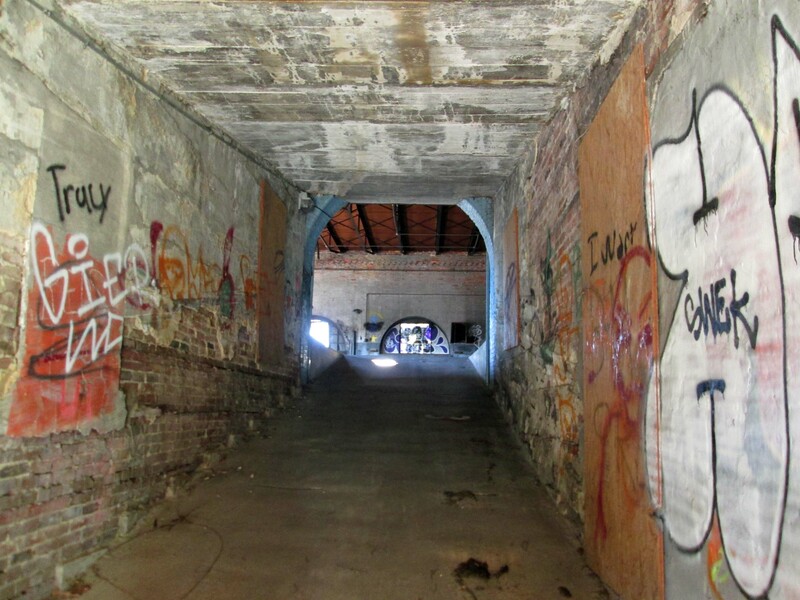 The drawings I have along with engineer’s reports all call these structures Gatehouses. Who changed it? 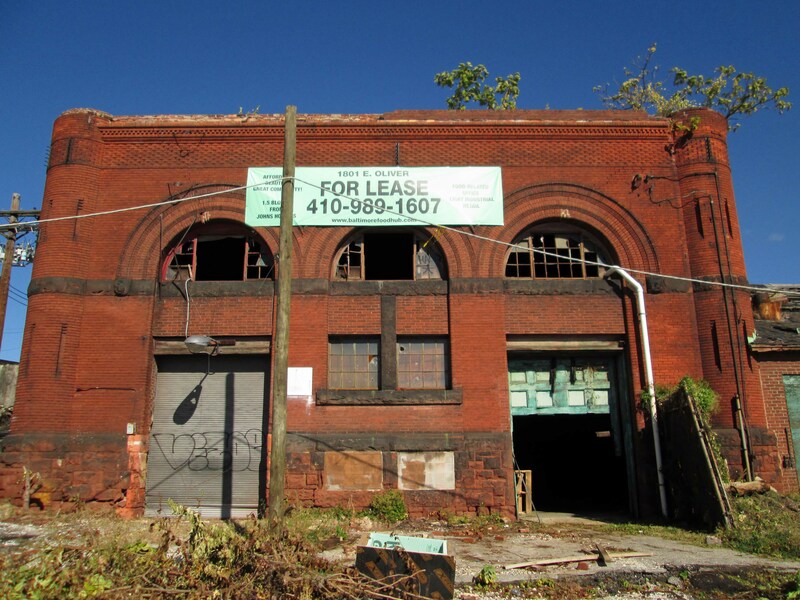 Would it be alright to call one of Baltimore’s Little Tavern Restaurants – Small Bar Restaurants? Hell no! Words mean the same but they aren’t. You go to a small bar to get drunk – you go to the Little Tavern for their bags of hamburgers!! I recently found a photograph of one I already have, that was mislabeled. 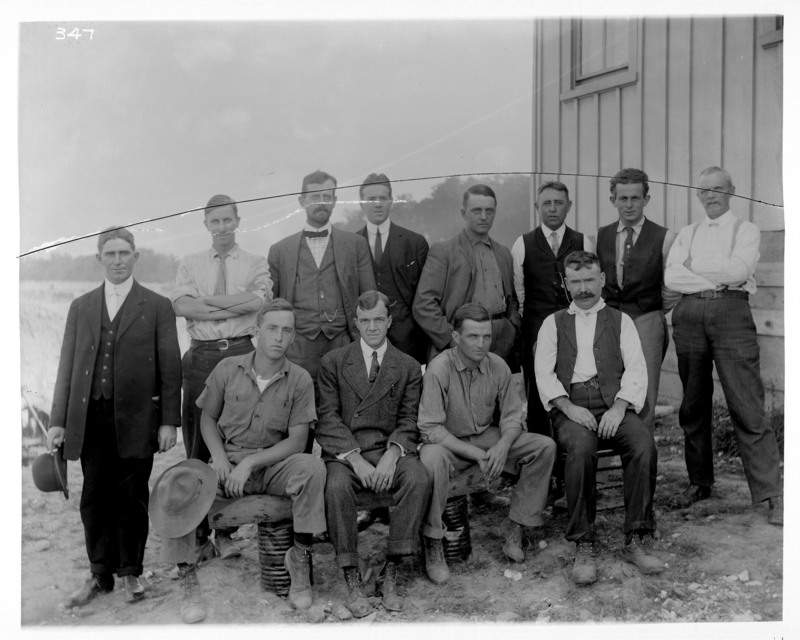 Below is the photo from a glass plate , the other is from a framed photo that hung in the engineer’s office (Bottom Photo from 1894). The framed one clearly calls the Clifton Gatehouse a gatehouse, not a valve house – Stop the insanity and call it what it is!!! 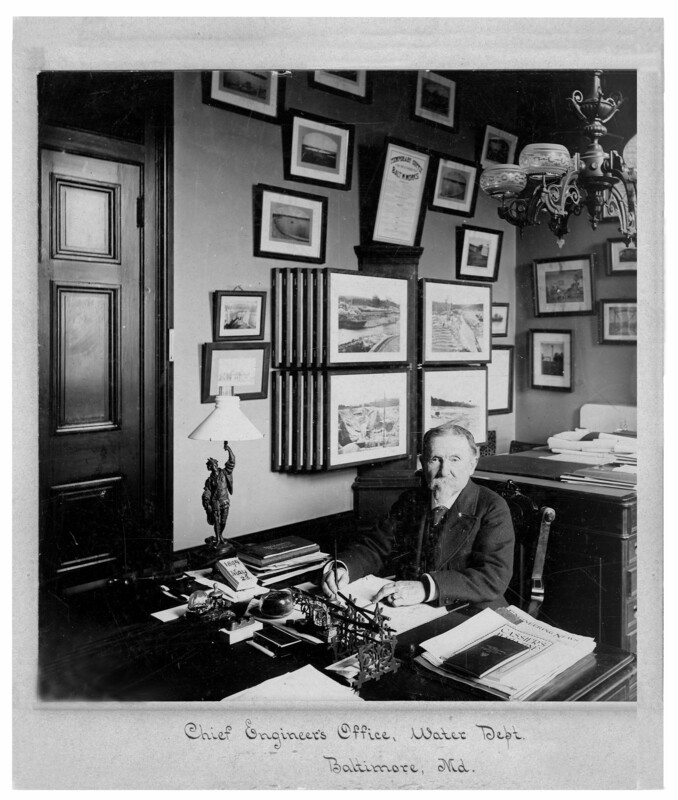 Engineer Kenley’s office, 1894 with framed photographs hanging on the wall. 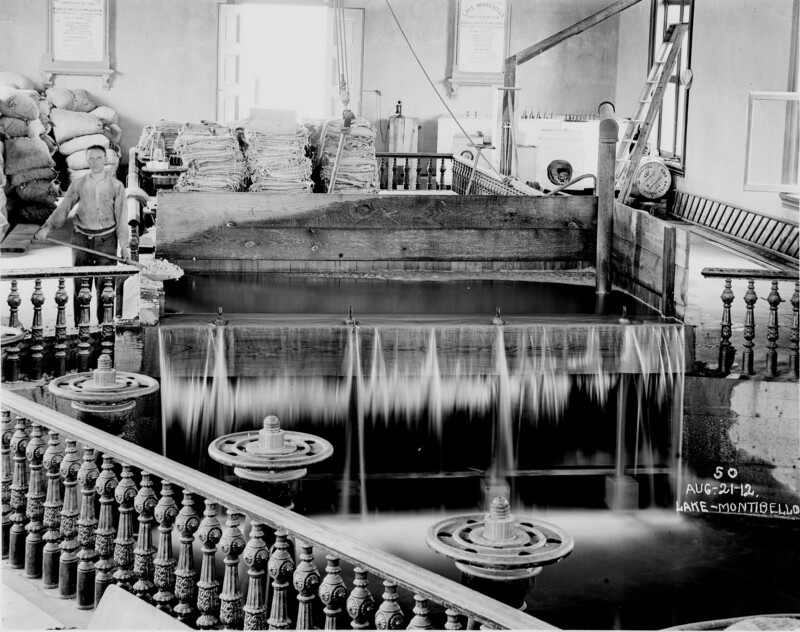 In 1881 the Permanent Supply started delivering water to Baltimore City, to help supplement the failing Jones Falls. 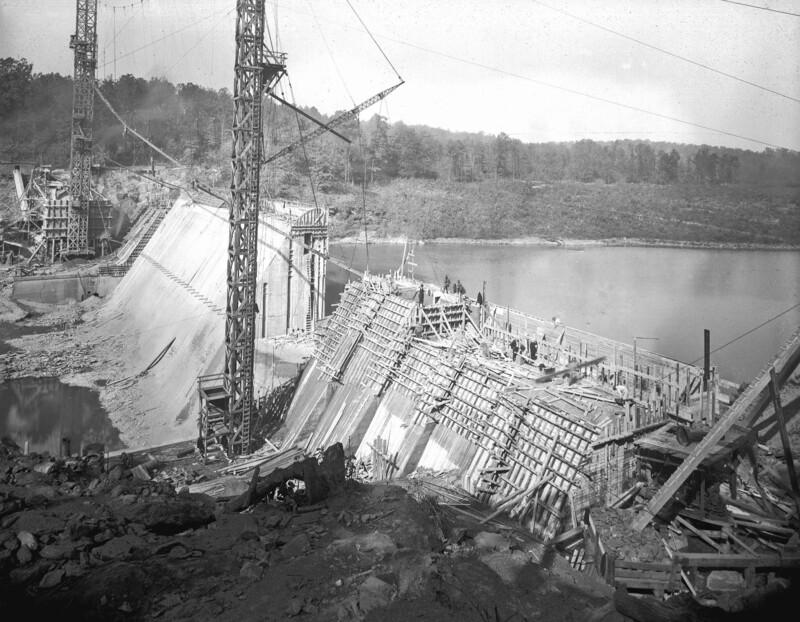 Over the next few years, the Jones Falls would become so bad that larger reservoirs would be needed. Especially after the annexation of 1888. 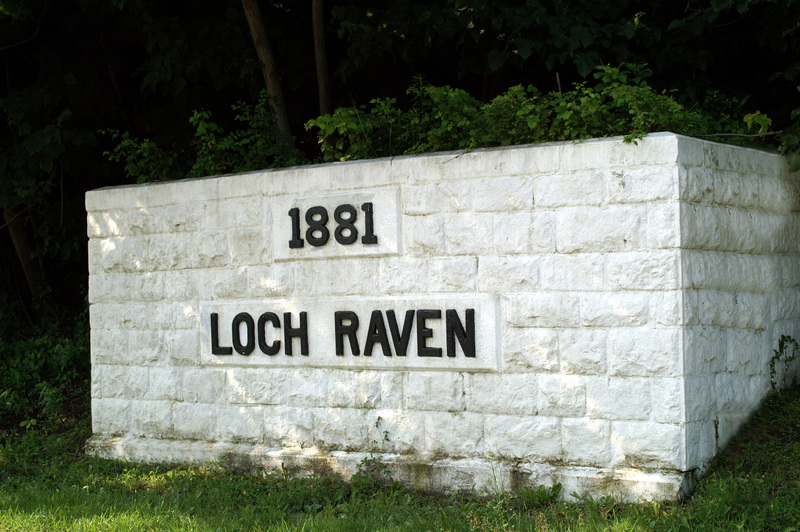 Plans started to take shape in 1904, after the Big Fire, to increase Loch Raven. 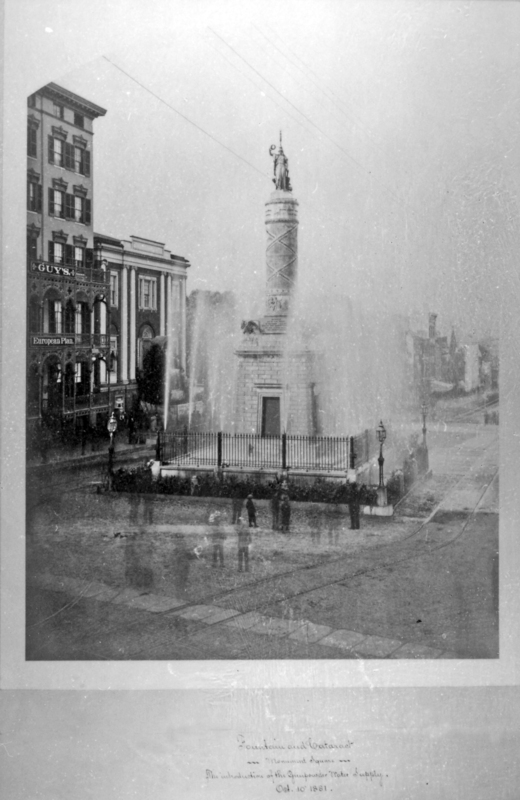 And because of pollution, Baltimore started testing various forms of filtration. 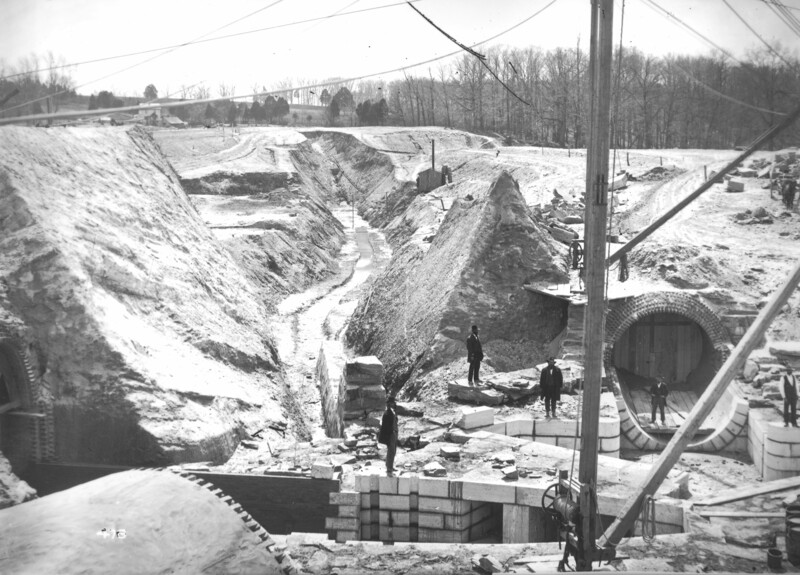 New pumping stations and reservoirs were built and/or their water redirected. 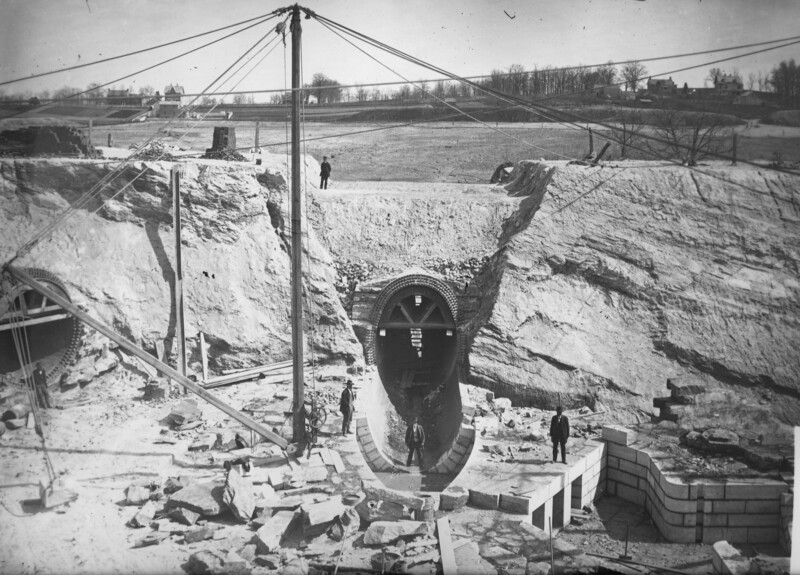 Mt Royal no longer was receiving water from the Jones Falls, but from the Gunpowder Falls, via pumping stations. 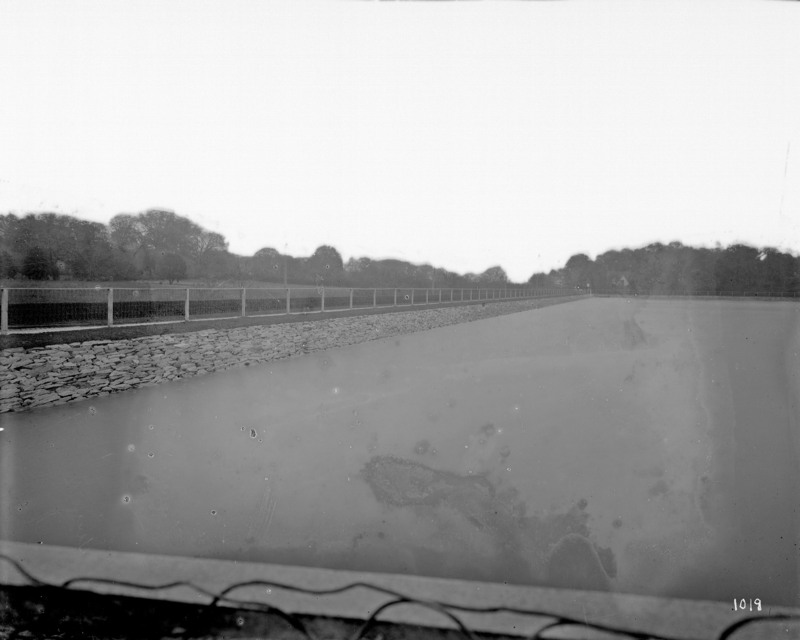 Below is the Mount Royal Reservoir, followed by the High Service Reservoir at Pimlico and below that the Eastern Pumping Station, which pumped water from Clifton to Guilford. 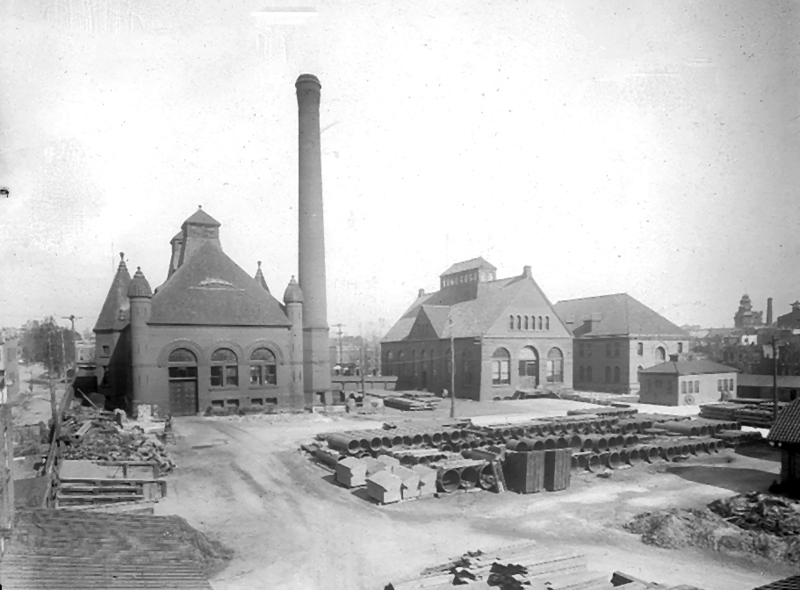 The Gunpowder Temporary Supply was in use between 1873 and 1881, as the City required it. 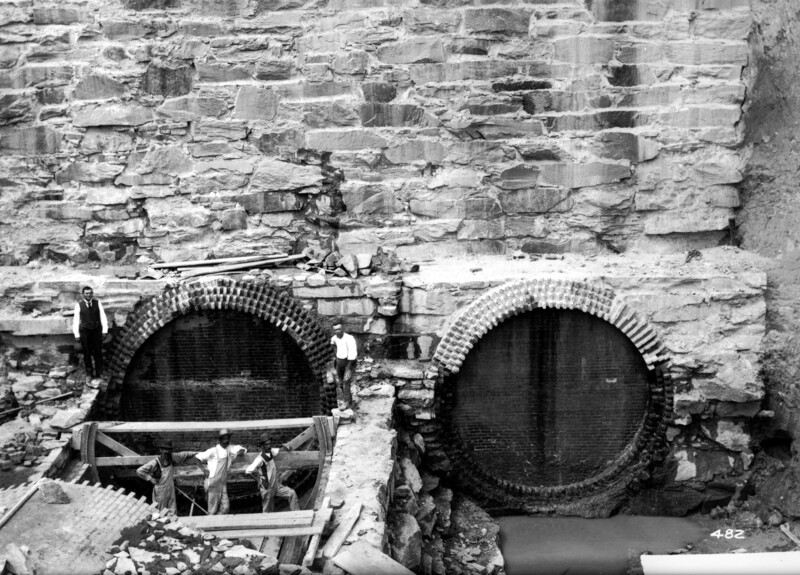 Work on the Permanent Supply started in 1875. 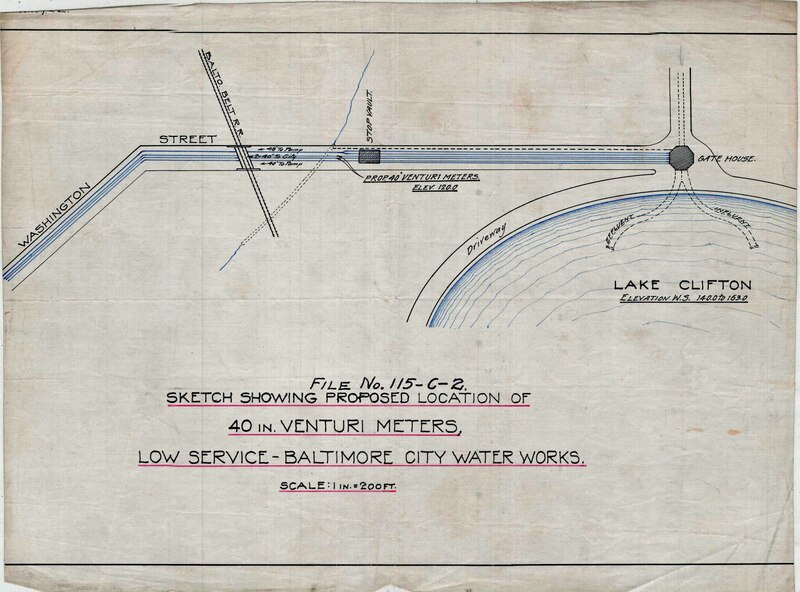 This new supply would consist of a dam at Loch Raven, a 6-1/2 mile tunnel to Montebello, where a lake would be built with a gatehouse, to connect to another lake at Clifton. The properties at Montebello and Clifton belonged to Garrett and Hopkins. 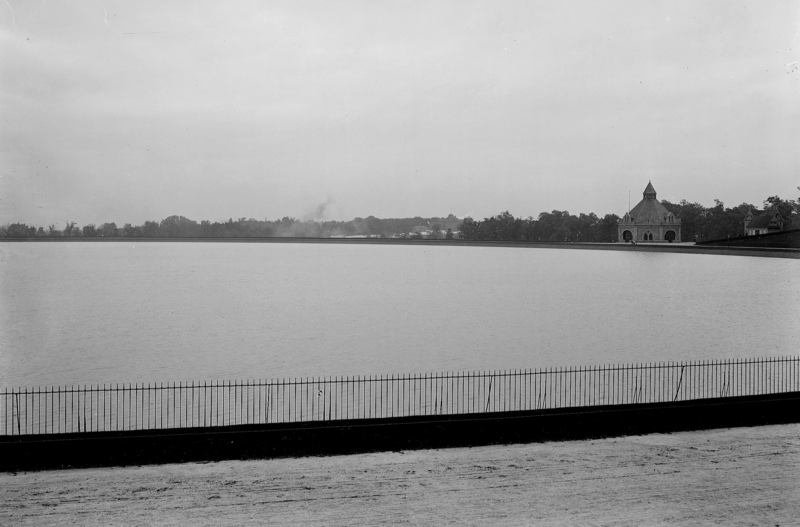 On September 29, 1881, Lake Montebello reached its full height elevation of 163′. 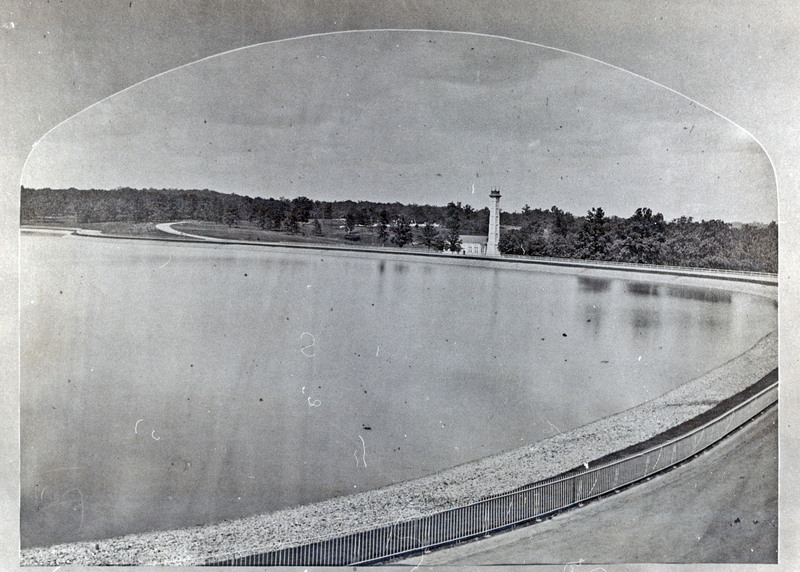 Lake Clifton would not be completed until late 1887. 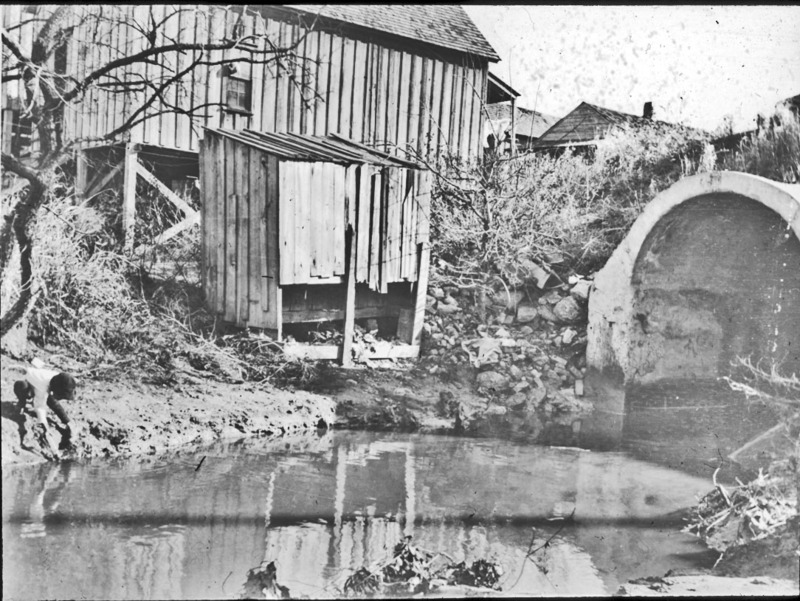 The water from Montebello flowed thru pipes, to the site of the lake and connected to pipes, to supply the City. 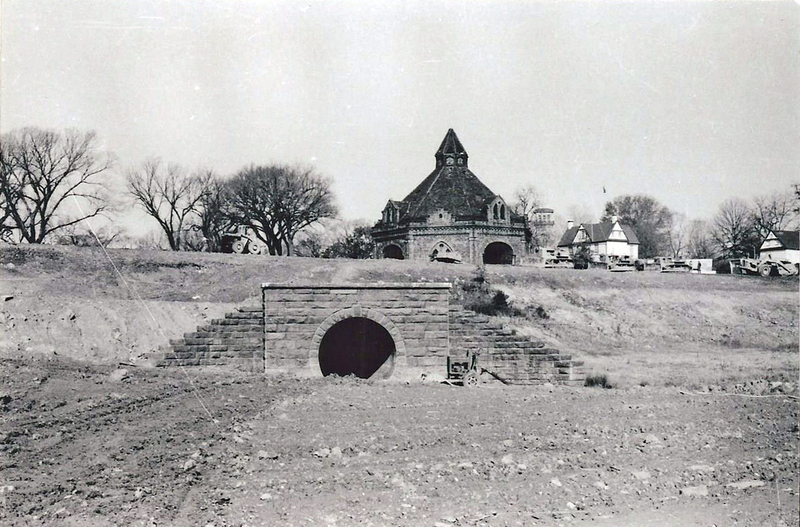 Until the lake and gatehouse were completed at Clifton, a temporary shed was built over the pits that housed the gate valves. There was a house built on the property for the Gatekeeper. 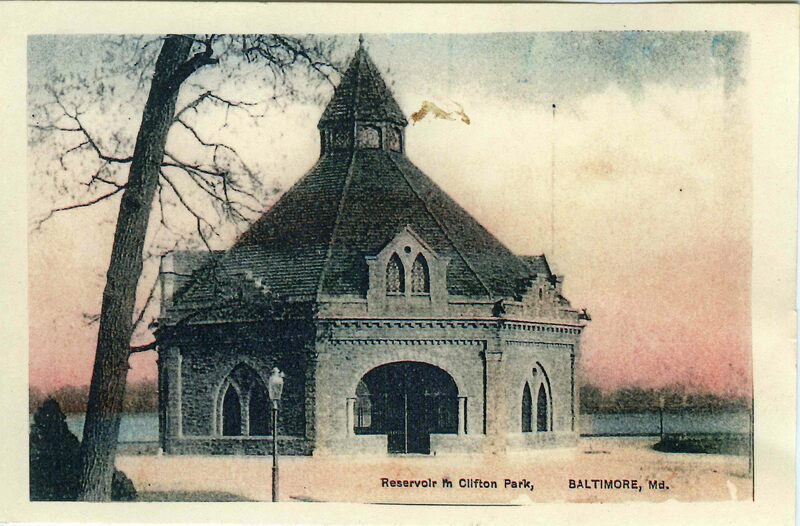 There was recent talk of leasing the Clifton Gatehouse for a Farmers Market, if the person would restore the building.